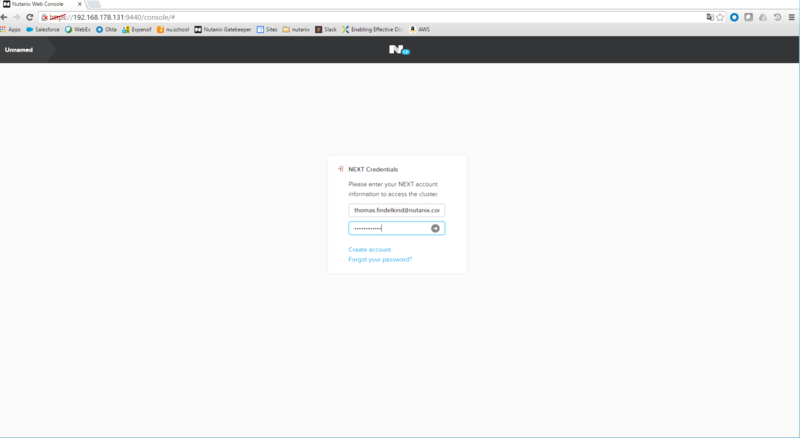 In this part I will focus on retrieving data from the Nutanix REST API. So basically this will show two important parts. 1. How to get data from the API ! 2. How to parse the data which is in JSON format within GO ! 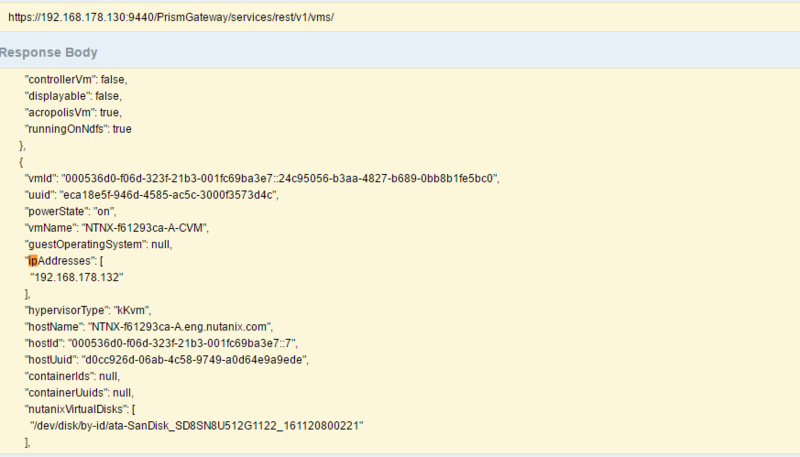 The URI “https://192.168.178.130:9440/PrismGateway/services/rest/v1/clusters/” will retrieve a list of the clusters. Which in my case is only one. 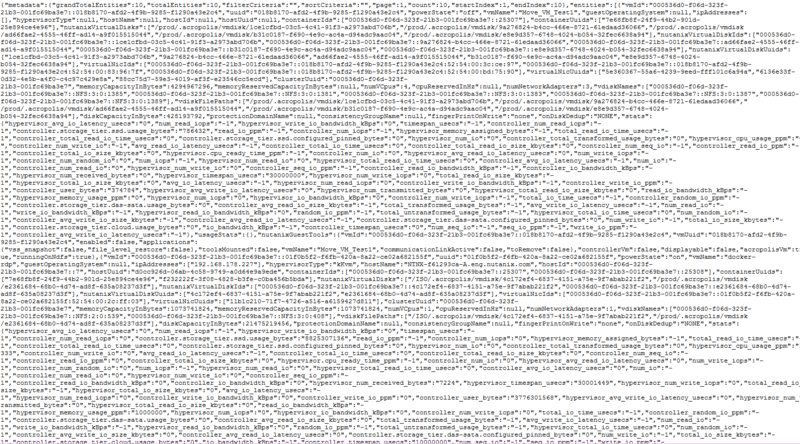 As you can see the data is in JSON format and needs to be parsed if we would like to use it. So there are two ways to do this. In this case we got a valid response. This means we do know the structure of the data now. What I prefer is to create a struct which should represent the data within go. To do this it would be great to have a documentation or SDK which defines a representation of all responses. 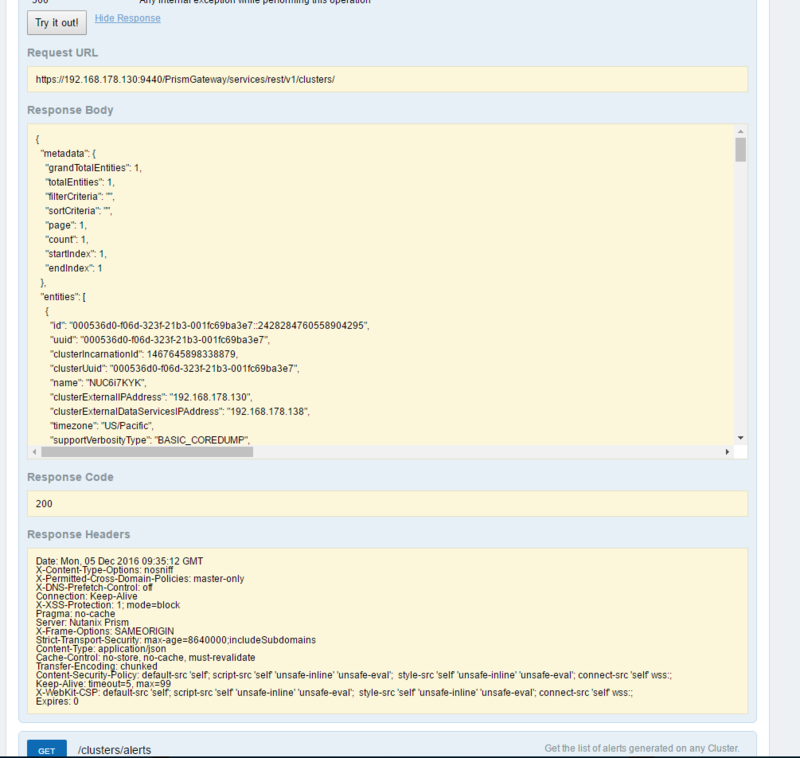 With AOS 5.0 there is a way to use swagger to generate this. But today we can just create our own struct based on the response. 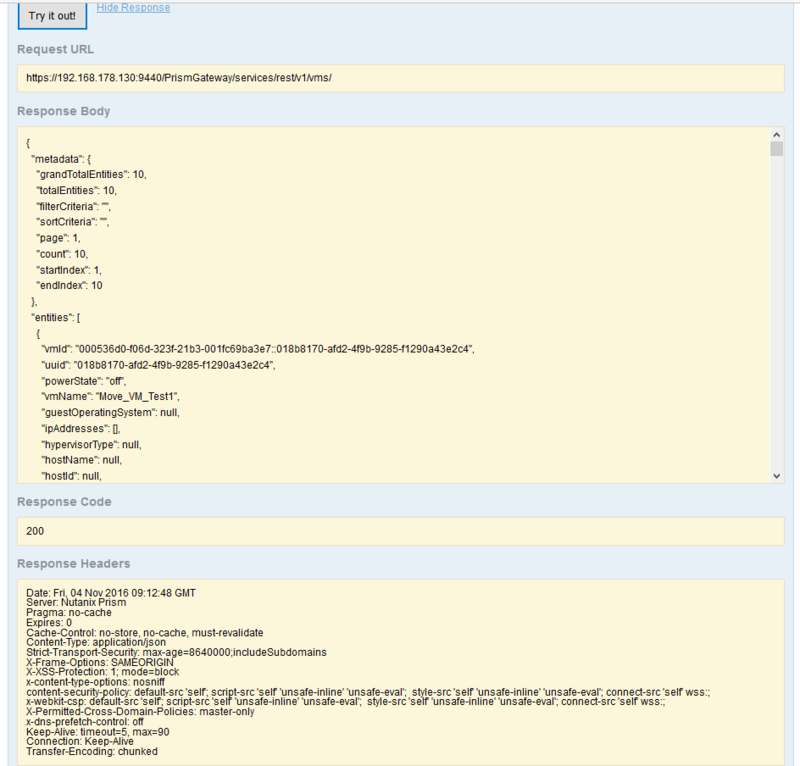 So copy/paste the response to JSON-to-GO will return this struct. We can just use this struct and parse the response to it. You may think: “This will end up with a lot of structs and they are just huge”. This could be the point where you have a look at the generic interface approach. 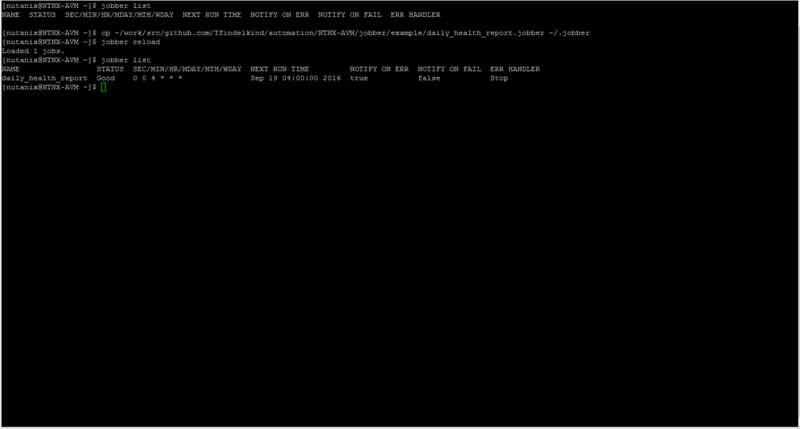 Making use of json.Unmarshal to parse the data into the variable clusterGetResp and print a few values to std out. 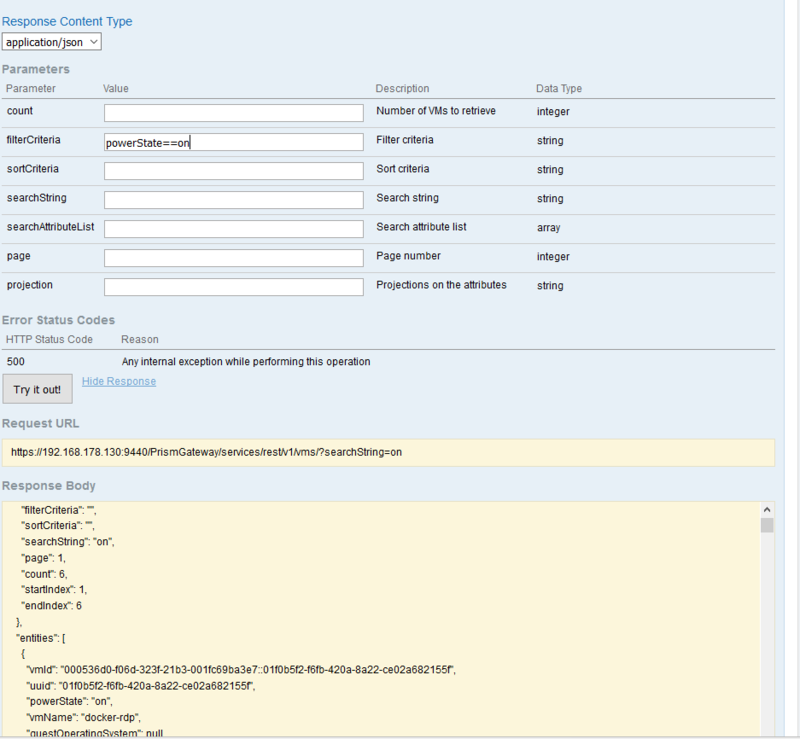 In the last example we made use of parsing json into structs. I prefer this way but there is a “simpler way” to achieve the same. Making use of the interface. 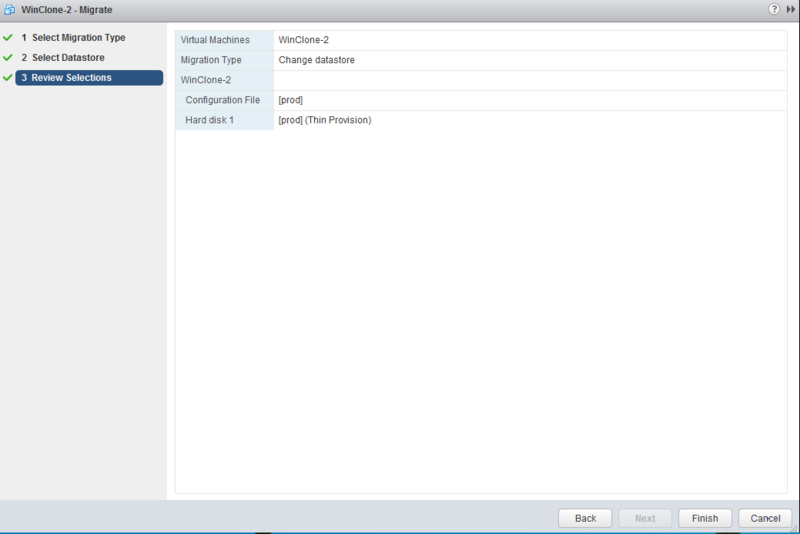 The aim of this example is to retrieve some information about a specific VM. 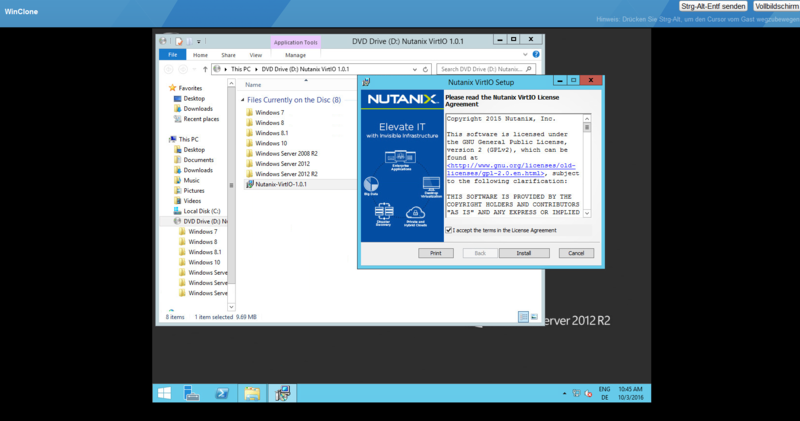 The first step would be to retrieve the UUID of the VM because the Nutanix REST API makes use of a unique identifier. 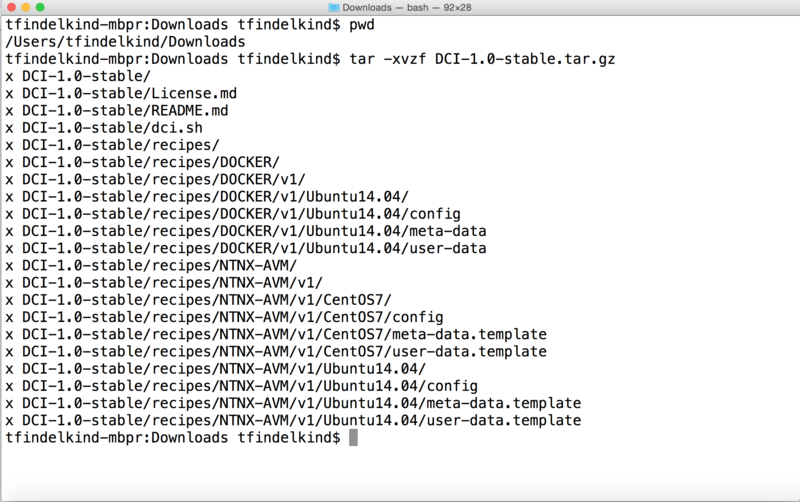 Lets get a list of all VMs and extract the UUID for the VM with the name “docker-mac”. Now we are able to request more info about this specific VM when requesting where bd74362d-2cb0-4d06-a95b-dfb7403c5a01 is the UUID. A special case ! 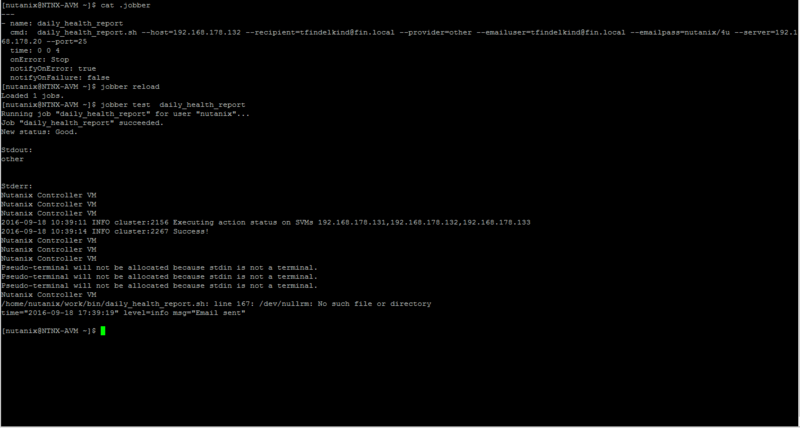 Getting the IP Address! 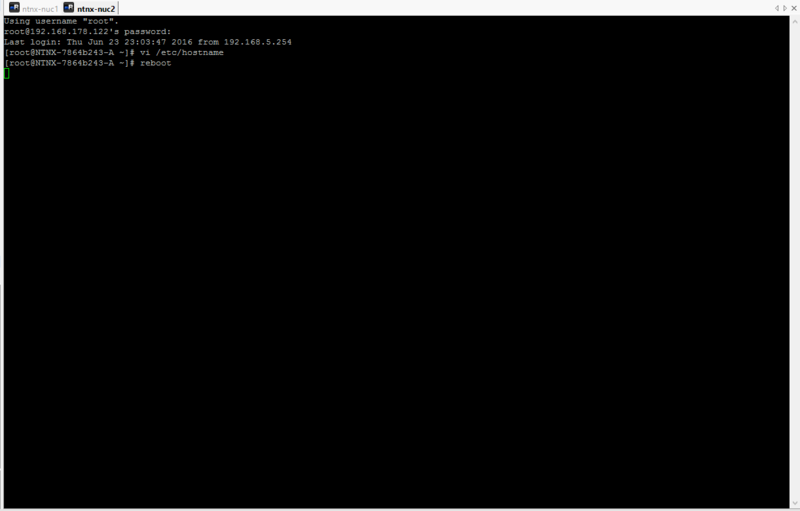 You may have noticed that there is no key/value which shows the IP Address of the VM. 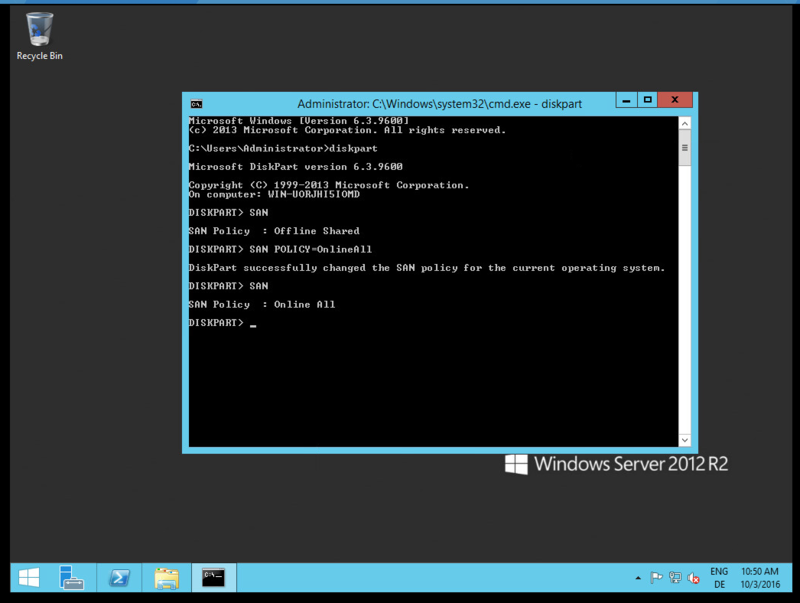 So first of all there are two different kind of IPs for a VM. 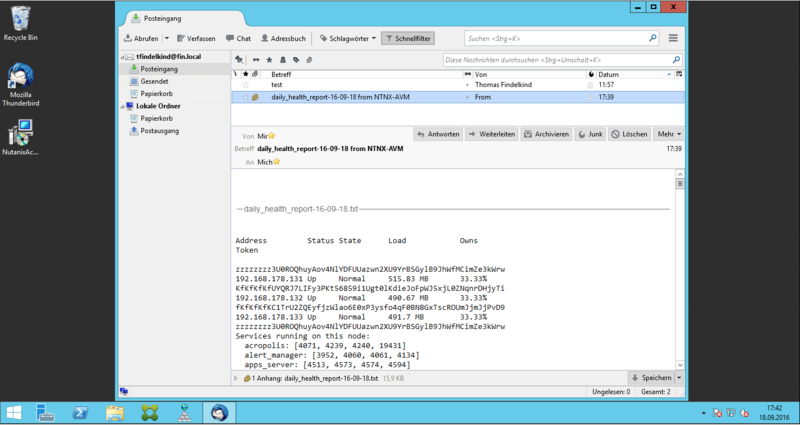 If you are using AHV than you are able to retrieve an IP for a VM from IP pools which are managed by AHV itself. 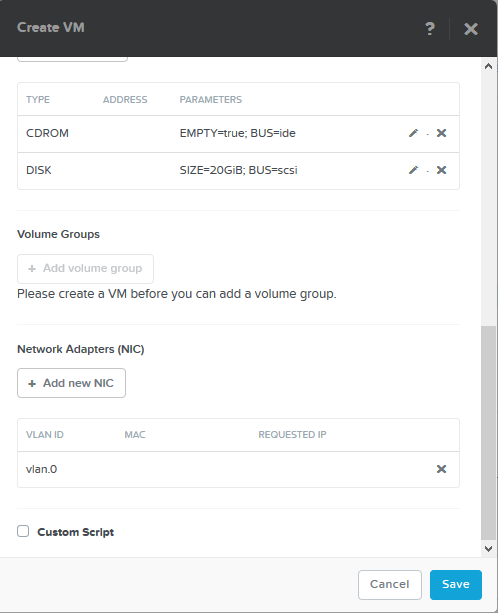 The other maybe more common way is that the VM get an IP via DHCP or it is statically set all without the “knowledge” of Nutanix. 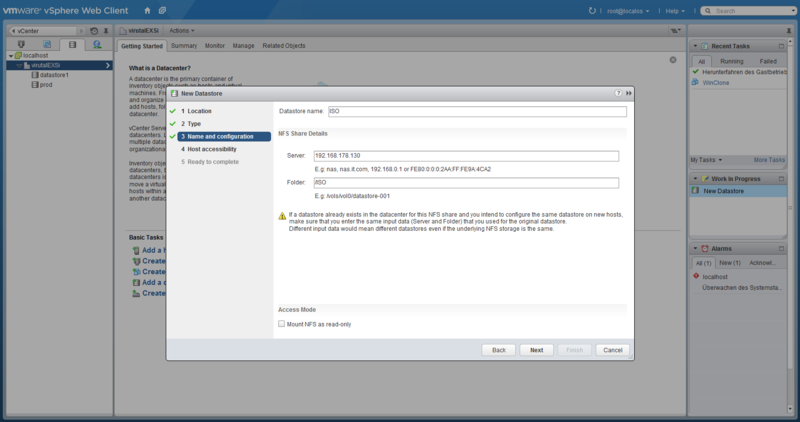 To retrieve the IP when it is managed via the AHV IP pool the way to retrieve the IP Address is as follow. 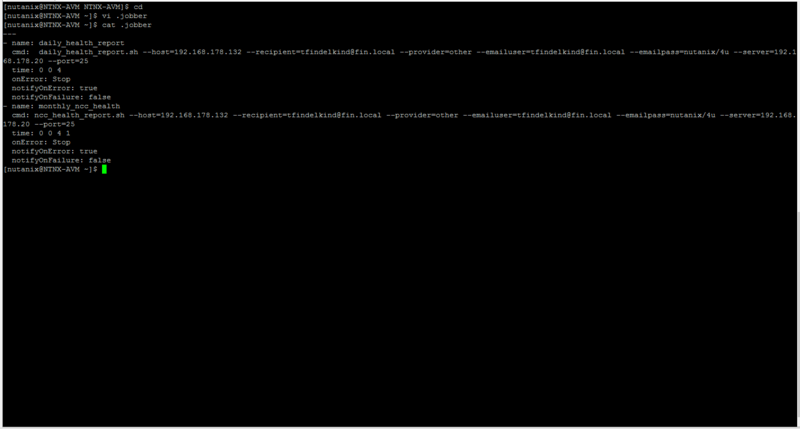 Just add the include_vm_nic_config paramter to the GET request and the NIC details will be included. 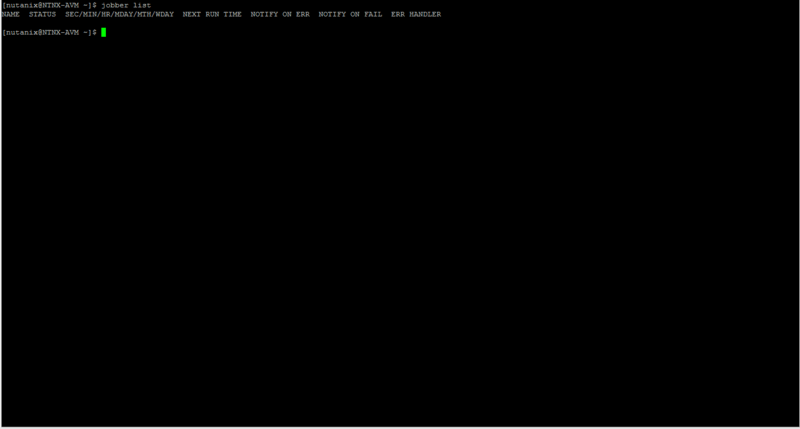 The implementation is a little bit ugly because of the interfaces/mapping etc. but can be done. 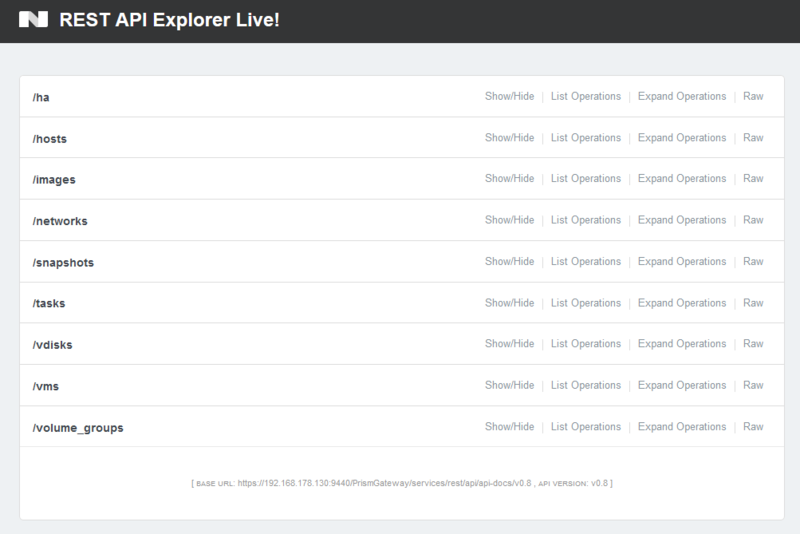 At the moment the v2 of the API is not able to provide the IP. So there is a fallback to the API v1 which just includes the IP. 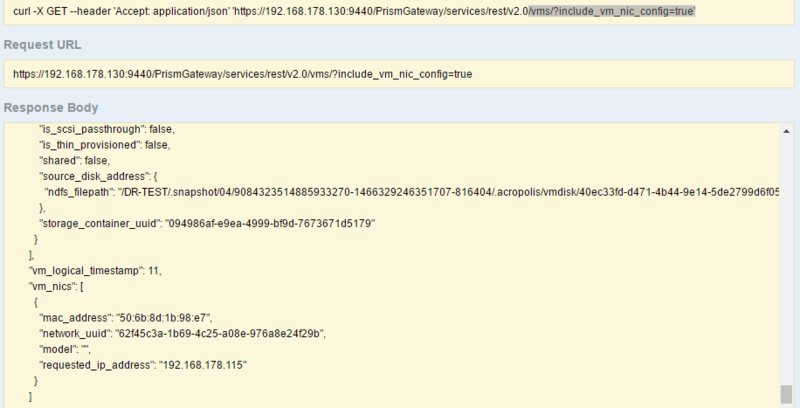 So a simple GET to https://192.168.178.130:9440/PrismGateway/services/rest/v1/vms/ will return all VMs and their IP Addresses. 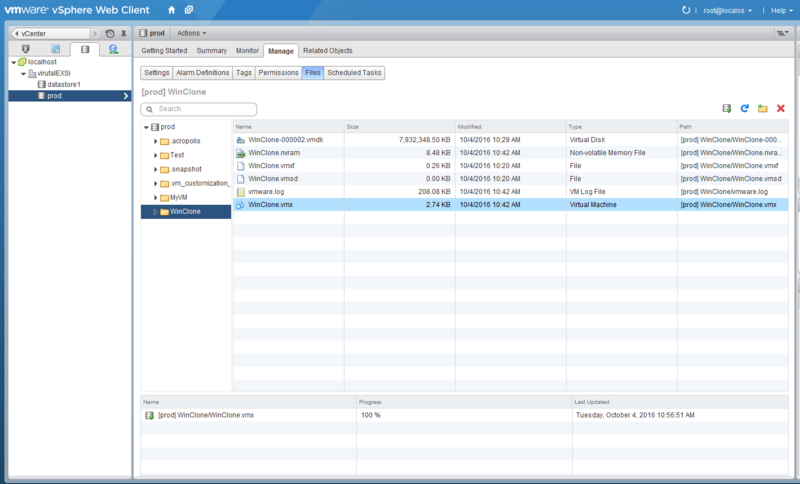 The implementation is pretty simple because the info is direct at the main level of the VM. 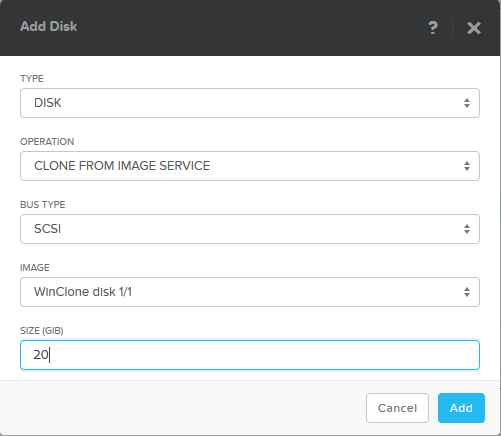 This entry was posted in Nutanix on February 16, 2017 by admin. 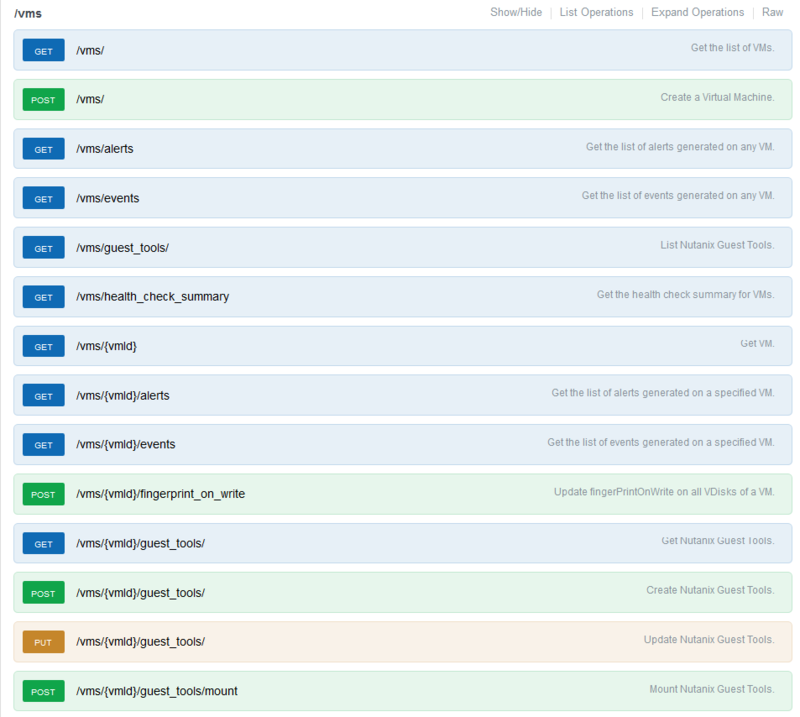 This blog series is dedicated to the Nutanix REST API and how to automate tasks based on the language Go leveraging the REST API. 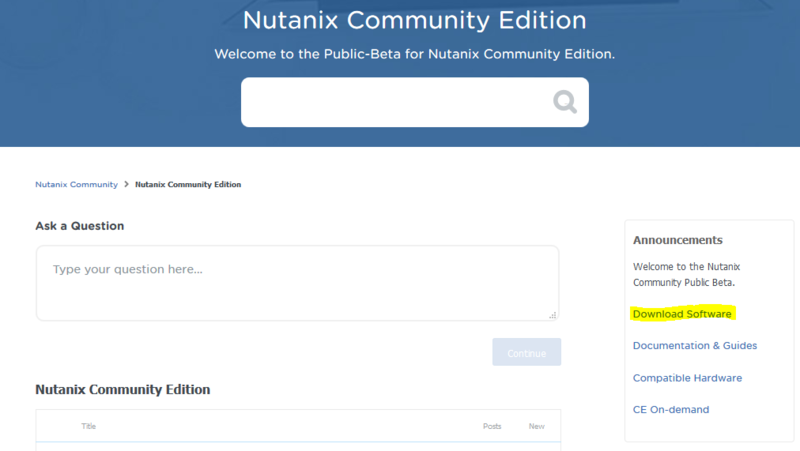 The official documentation can be found here: http://developer.nutanix.com/ but this tutorial was started before this has been announced and will focus on the whole process of development with GO and Nutanix REST API. 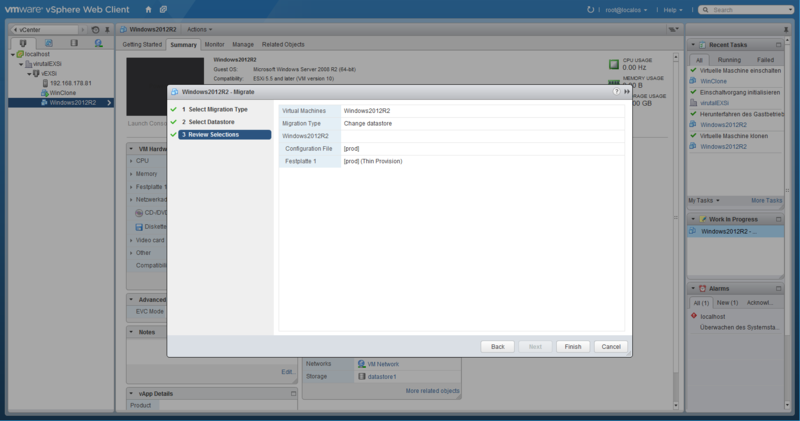 Create VM, VLAN, vdisk, projects…. 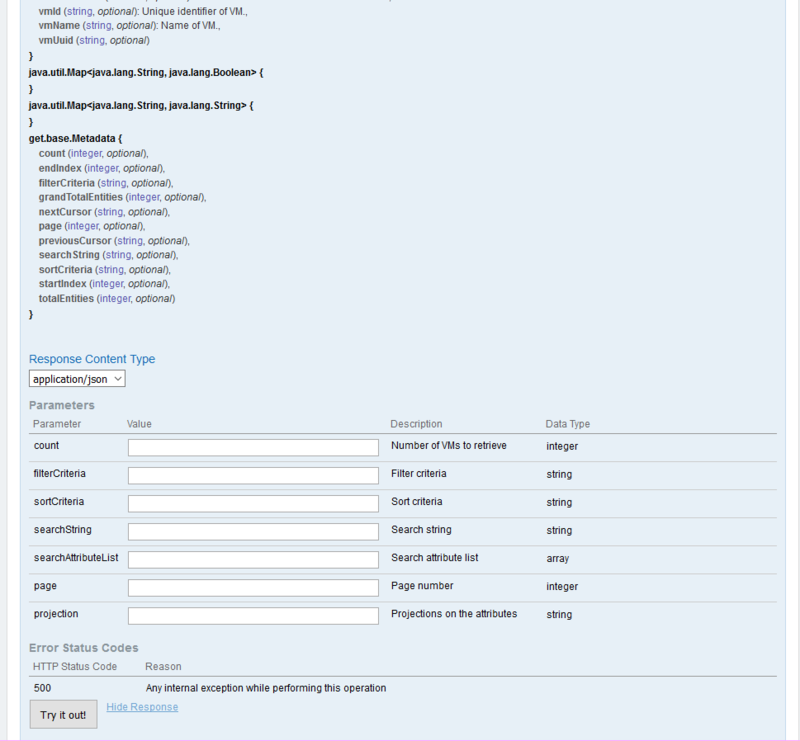 This part will show the basic REST API entry points and how to use them directly. Starting with AOS 5.0 there have been some changes! 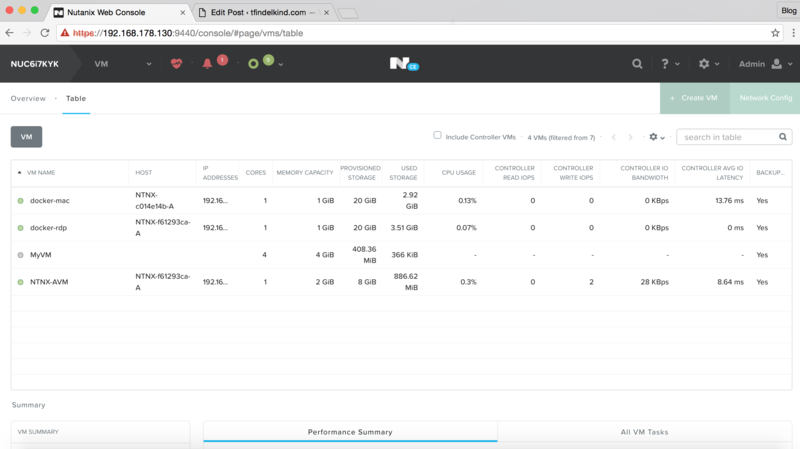 The first step is to learn a little bit more about the Nutanix REST API. 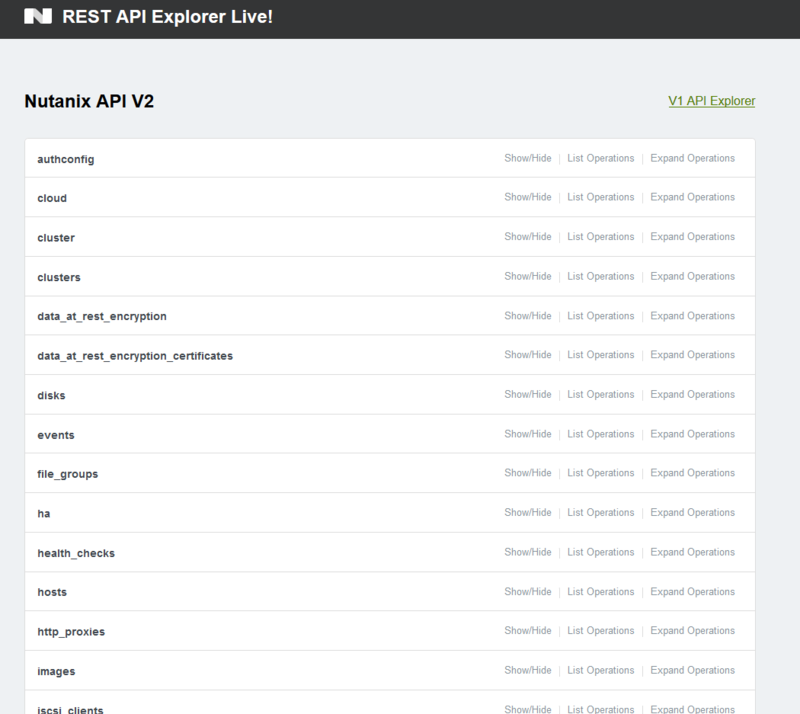 So there is a REST API Explorer which shows/documents the versions (v2 and v1) of the Nutanix REST API. 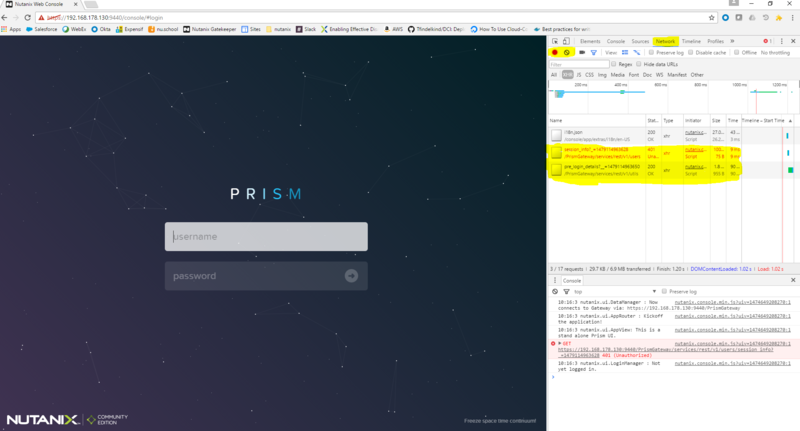 Hint: You may need to login to PRISM before you are able to browse/use the REST API Explorer! 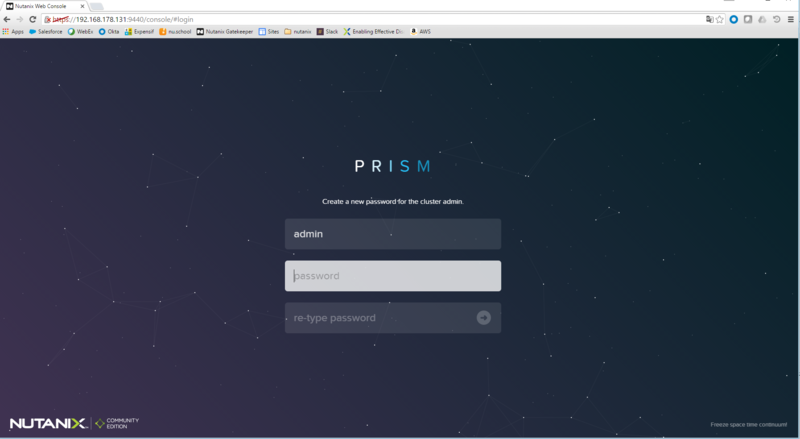 The PRISM GUI is using the REST API. 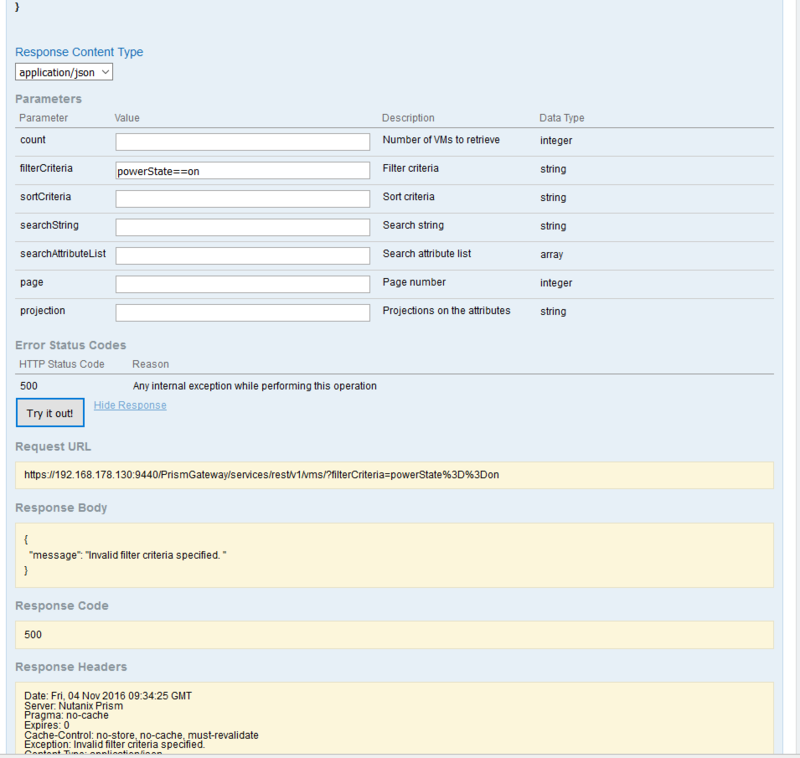 This means everything you can do in PRISM can be done via the REST API and even more. I believe it makes no sense to explain every method of the REST API right now. Instead I will show some basic examples in this tutorial and explain it via implementing use cases. But feel free to browse through the different methods/objects. 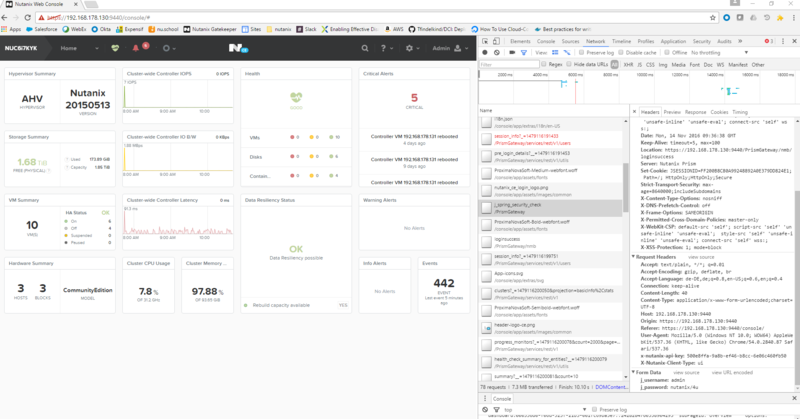 Click on /vms and you are able to see the standard HTTP methods like GET/PUT/POST/DELETE which are used to modify/create/get VMs based on the Nutanix plattform. 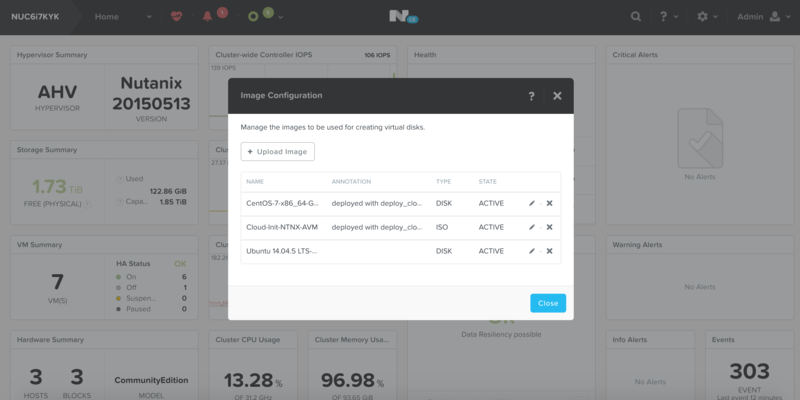 Retrieve a list of all VMs which are running on Nutanix! or you could use a tool like curl but you need to handle the authentication as well. I will talk about authentication in the second part of this tutorial. But back to the REST Explorer because this can be done easier. If you scroll down in the /vms/GET you will find a button called “Try it out!” which will do exactly the same for you! Click Try it out! 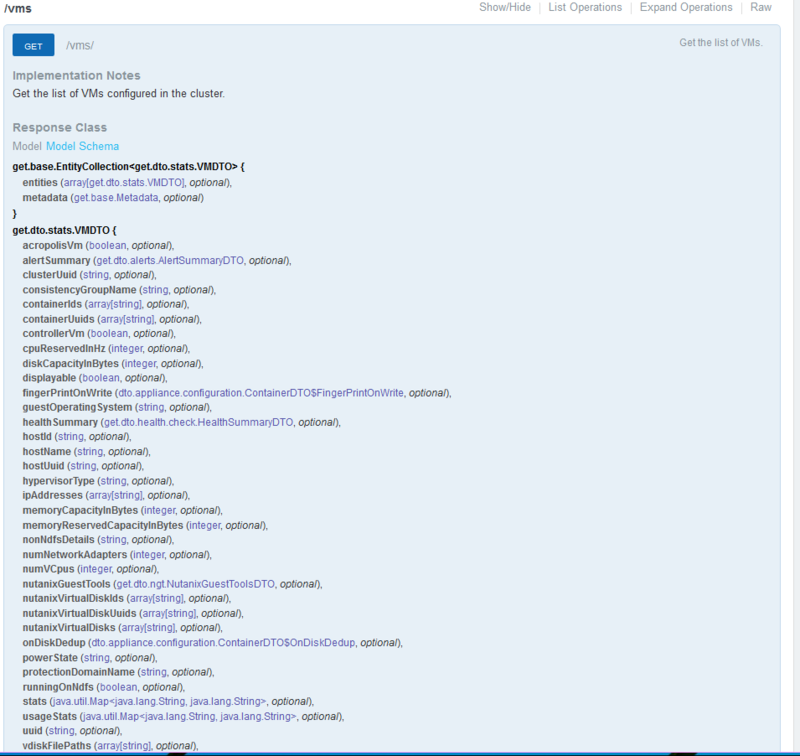 You will see that the format of the response which is JSON can be much better viewed now and we get some nice details! 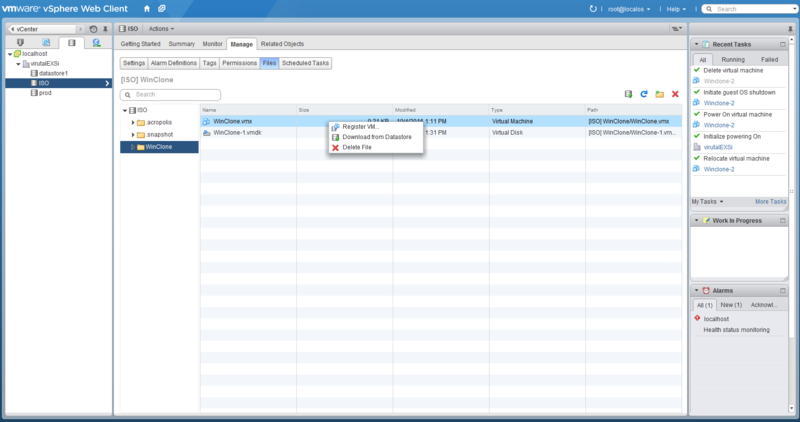 But this lists all VMs which are configured and not only the once which are running. We would like to change this. 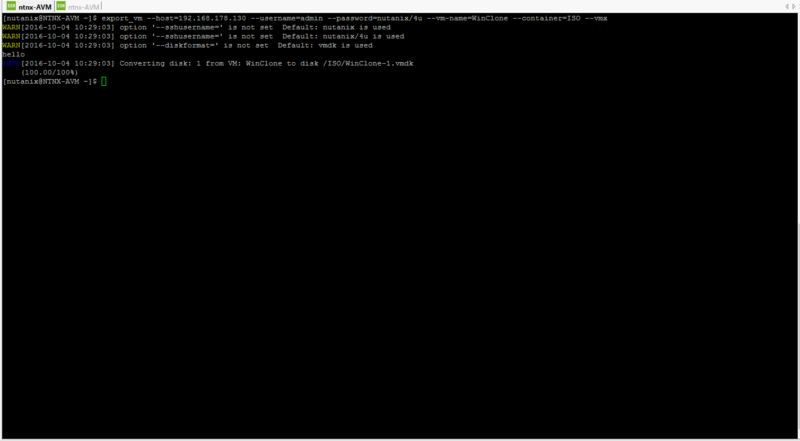 Let’s first search the response if any key shows the actual state of the VM! You may found a key called “powerState”. 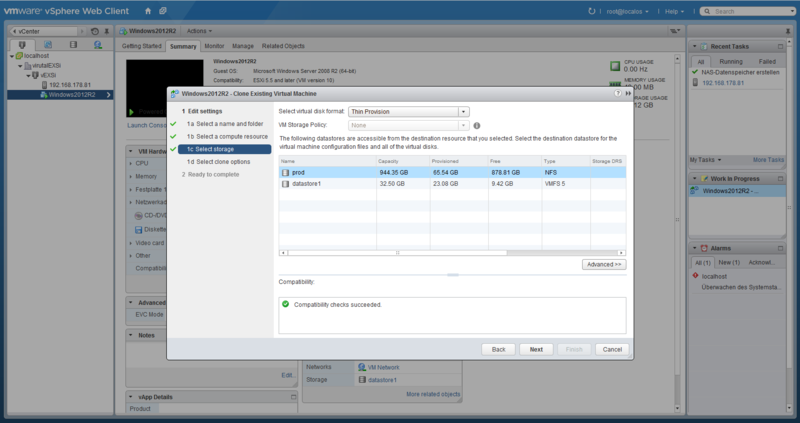 Let’s than try to filter the response and only retrieve the VMs which are “on”. 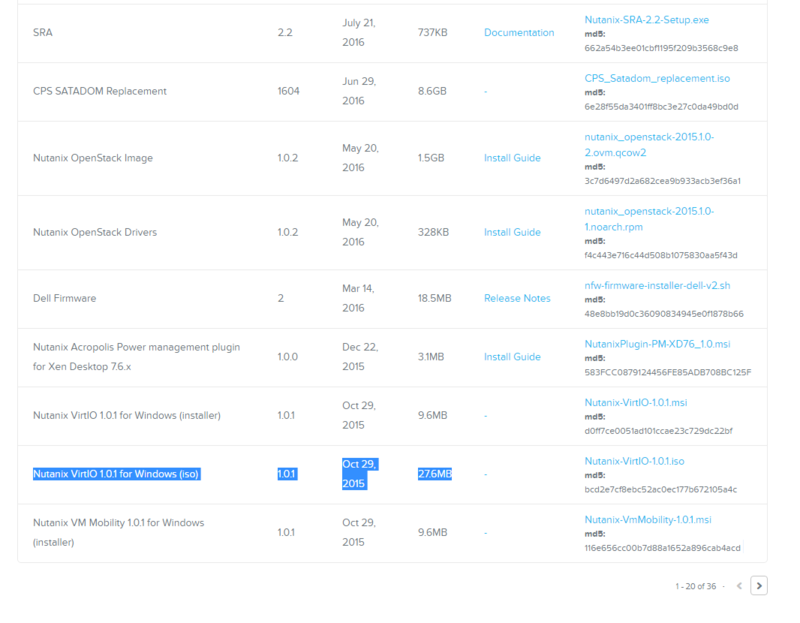 For this case the we are able to use the option “filterCriteria” in the REST API Explorer to only find all VMs which are powered on. Type in “powerState==on” in the filterCriteria field and try it again. If you would like to learn more , about the filter you could use on a query, use the arithmos_cli on the CVM to get more details. This completes part 1 of this tutorial! It will get an update soon with the new API coming with the Asterix release (v2 and v3)! 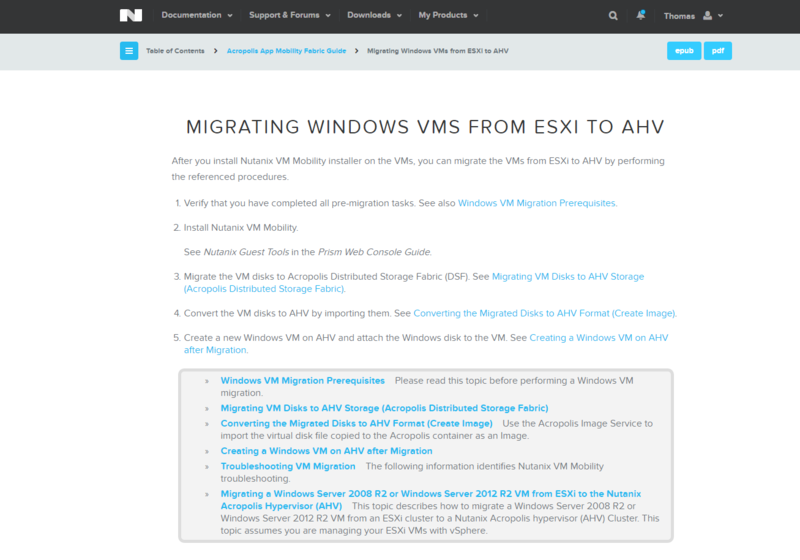 This entry was posted in Nutanix on November 4, 2016 by admin. 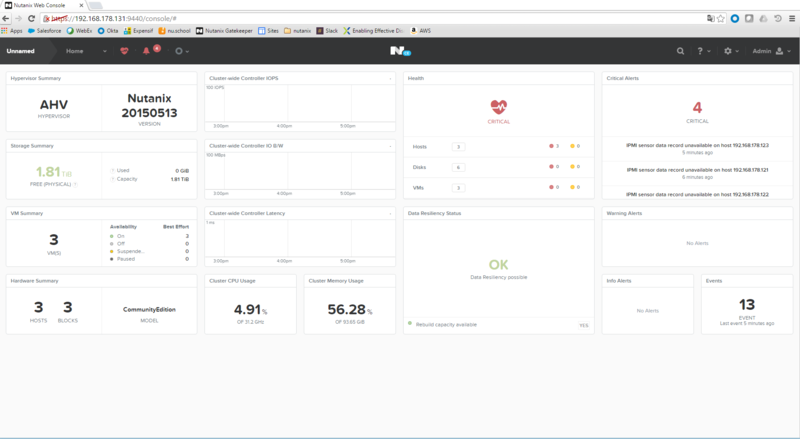 Today I upgraded the Intel NUC cluster based on Nutanix CE. This was pretty easy. 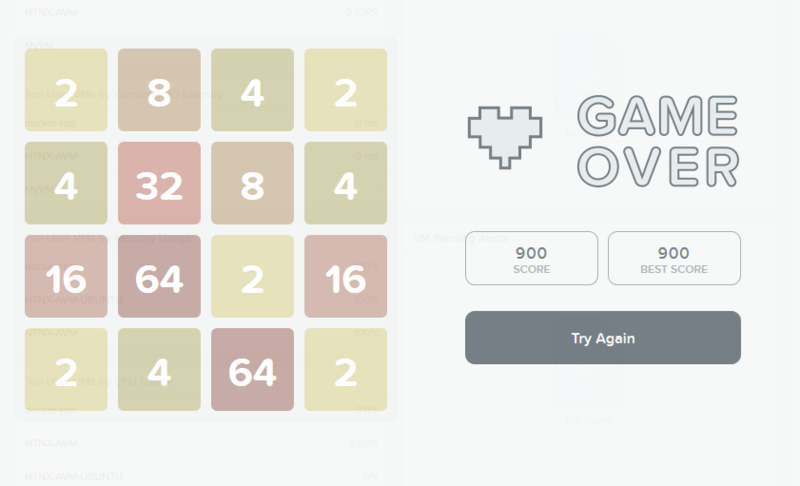 I played the game “2048” but I was not really good this time. 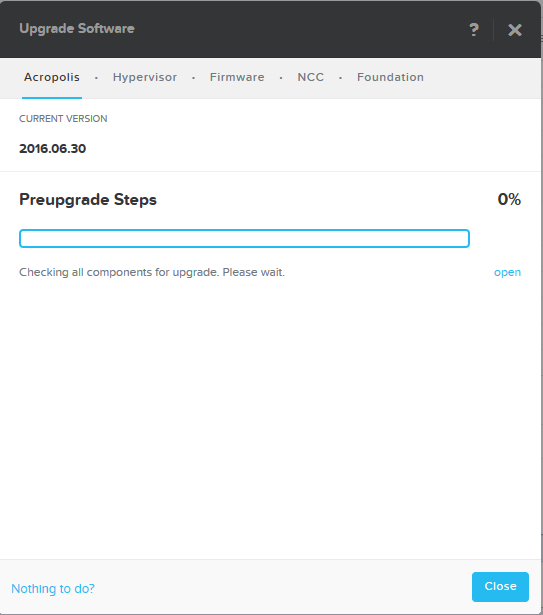 So I checked the upgrade process. Not ready…. Wrote some emails than. 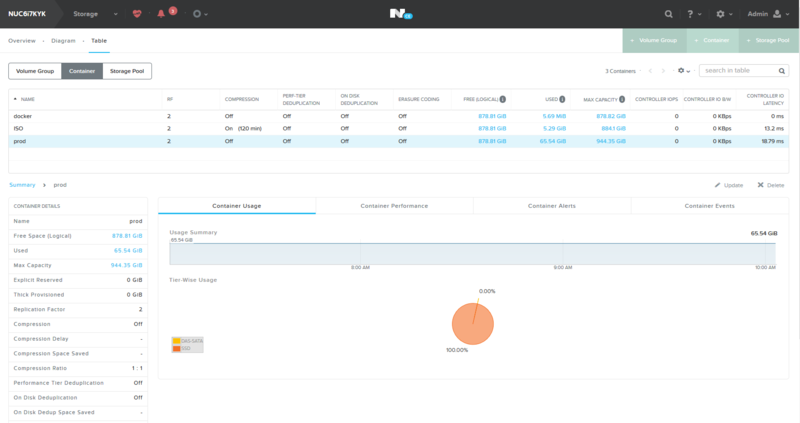 This entry was posted in Nutanix on October 6, 2016 by admin. 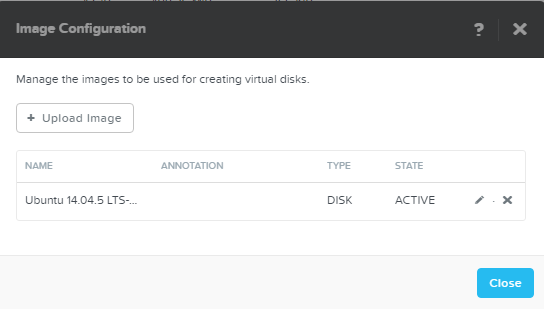 Now it’s time to create a Nutanix cluster. 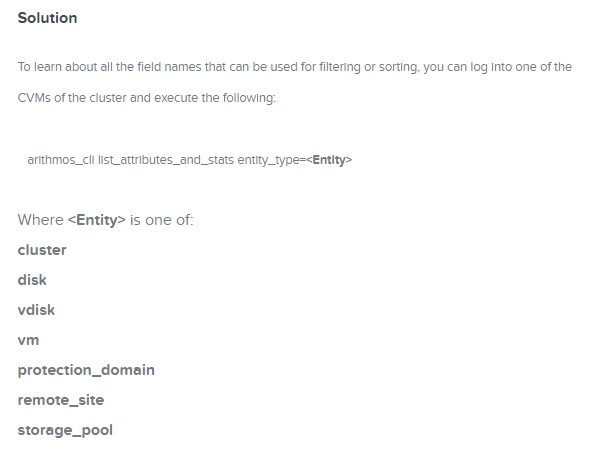 But there are some default settings I would like to change before I create the cluster. This is not mandatory but this will increase the usability in the future. Just jump to the create cluster part if you want to skip that. Use a ssh client like PuTTY or my favorite mRemoteNG to connect to the AHV (Host) IP. 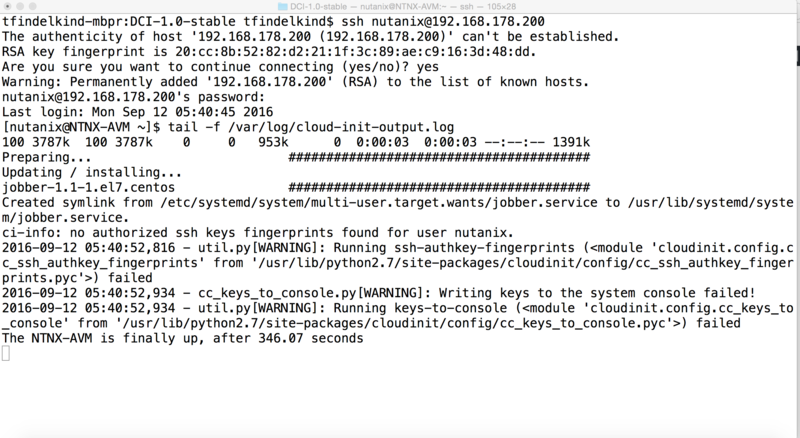 Use the default password when connecting as the “root” user which is “nutanix/4u”. Use a text editor like vi/nano to edit the “/etc/hostname” file and change the entry to a hostname you would like to have. 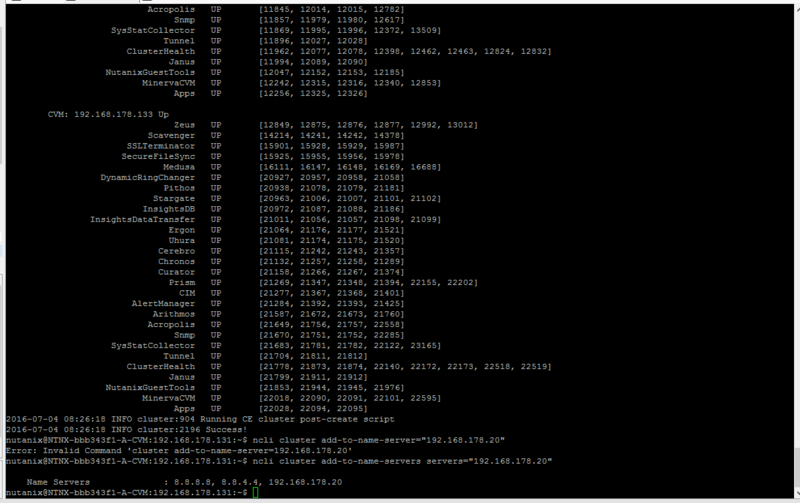 The following table shows the hostnames i used in this setup. 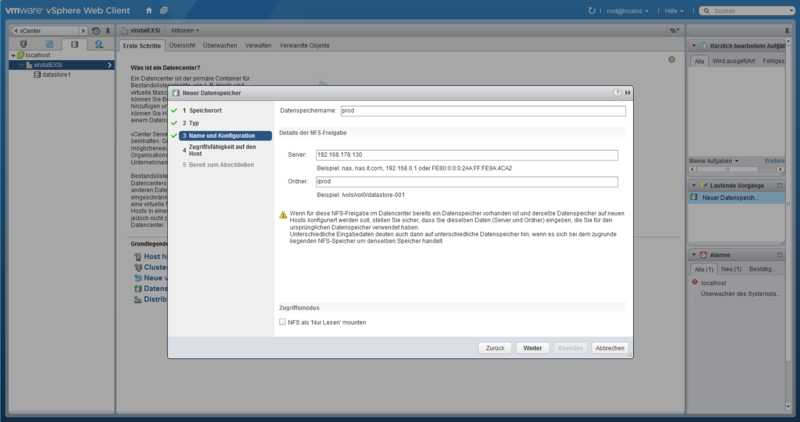 By default the timezone of the AHV hypervisor is PDT (Pacific daylight time). 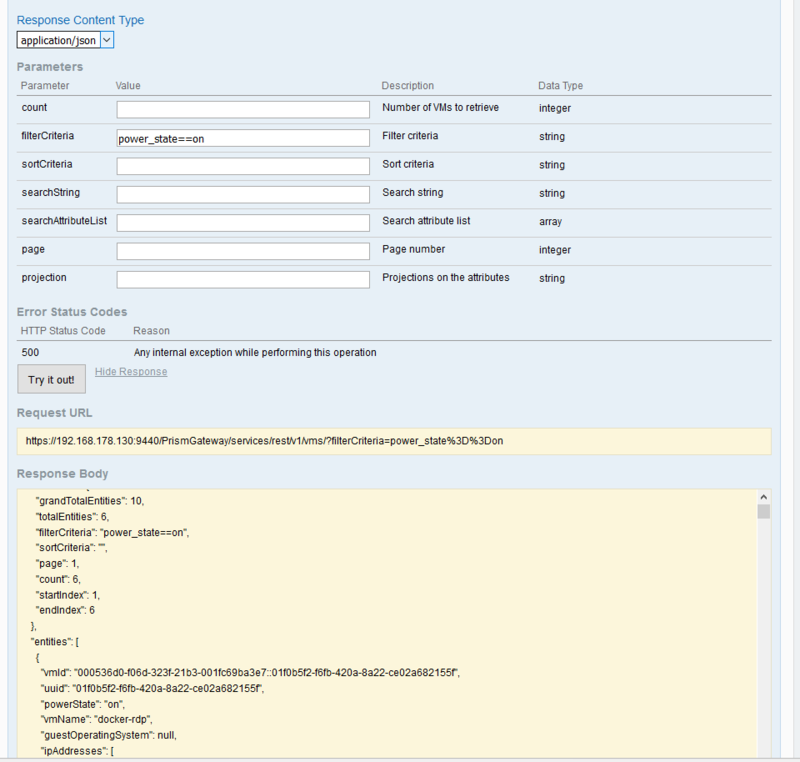 From a support perspective it makes sense that all logging dates are using PDT, so that it is easier to analyse different log files side by side. But I would like to have the time in my timezone which is Germany. To change the timezone it is needed to use the correct /etc/localtime file. 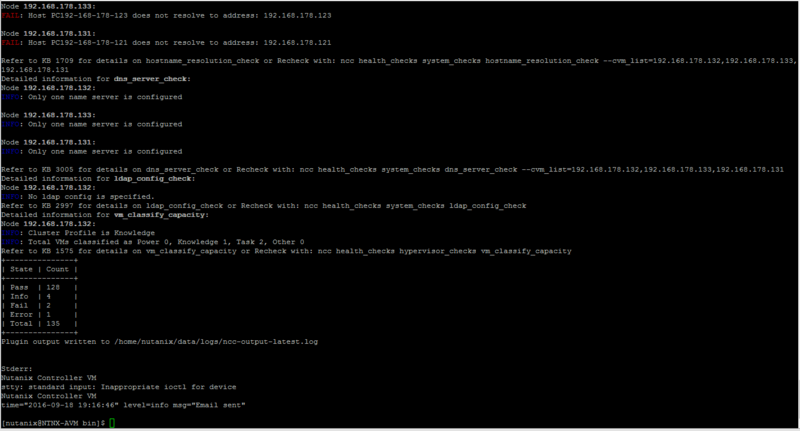 You can find the files needed in “/usr/share/zoneinfo”. This is a tricky part. I could not found a solution to change the CVM name. It seems there is no way to do this. 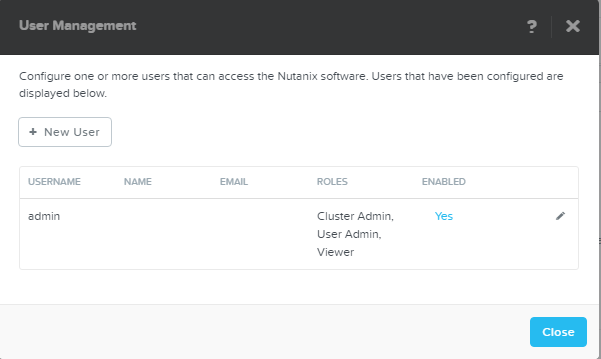 There are two ways to install a multi node Nutanix CE cluster. 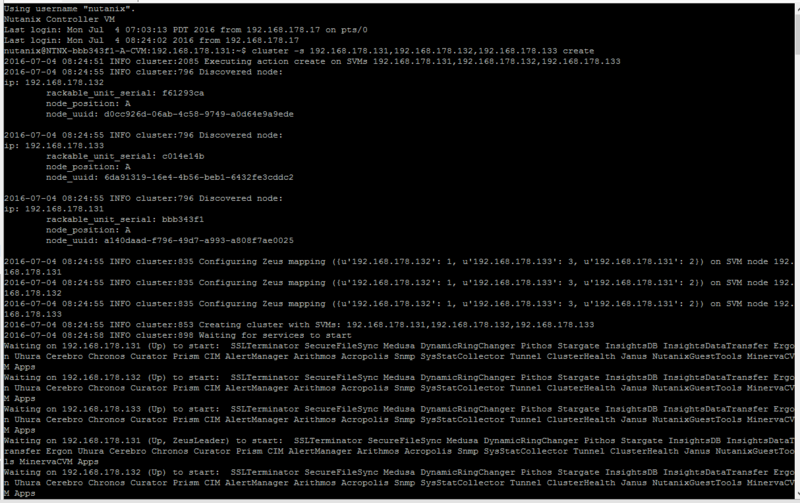 Via the cluster init website or via the command line. Enter the needed values and start the creation. 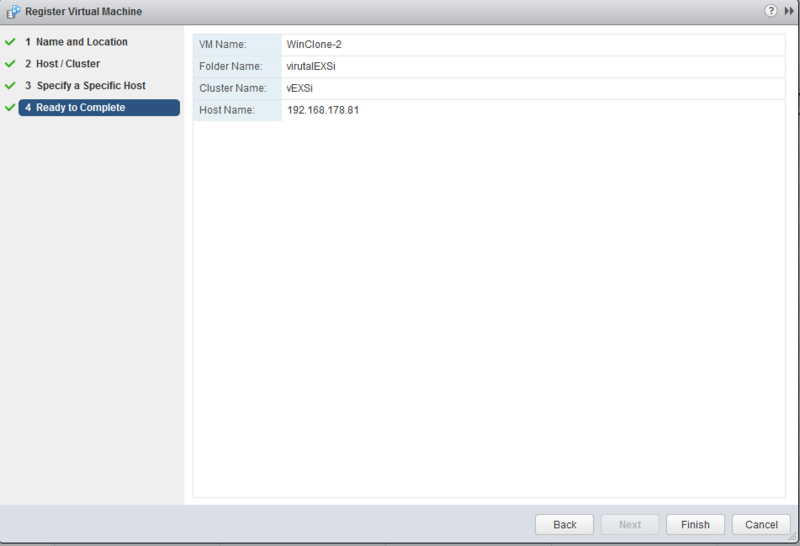 We need to connect to one of CVMs of this setup via ssh with user “nutanix” and password “nutanix/4u”. The creation is pretty simple which involves two steps. 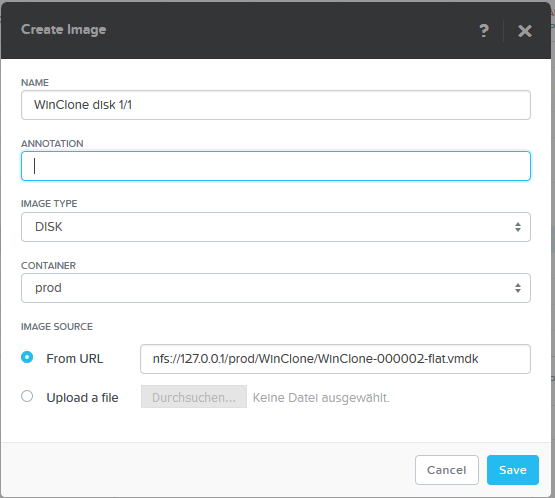 Invoke the create cluster command and set the DNS server. 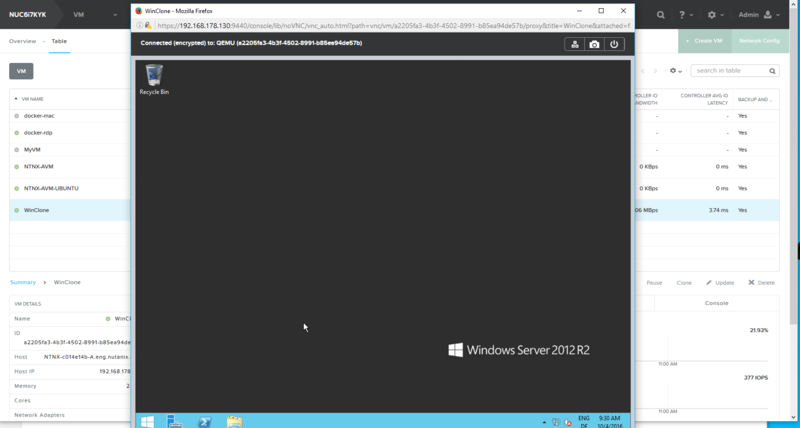 cluster -s 192.168.178.131,192.168.178.132,192.168.178.133 create ncli cluster add-to-name-servers servers="192.168.178.20"
When login the first time after the installation you will be asked to change the admin password. The NEXT Credentials which have been used for the download need to be entered now. This means that Nutanix CE edition needs a internet connection to work. There is a grace period which should be around 30 days. Prism will be be shown now and it’s ready to go. 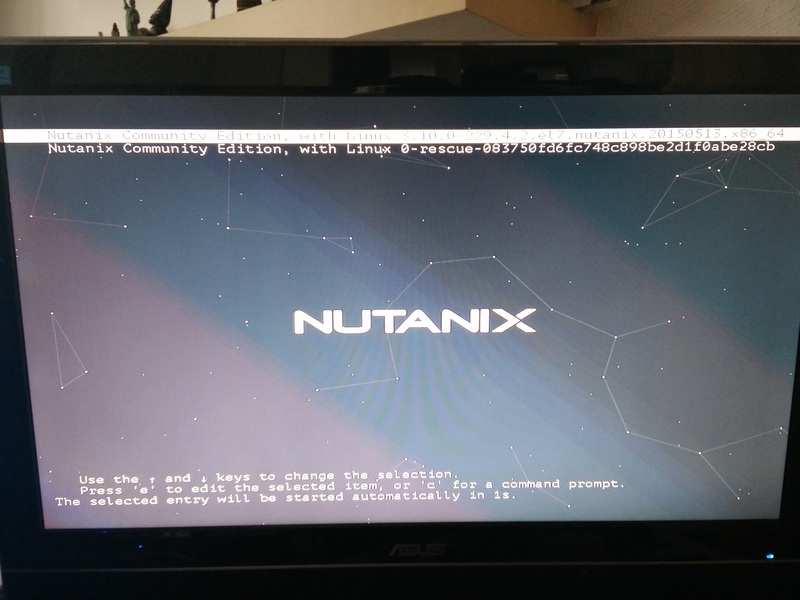 This entry was posted in Nutanix on July 4, 2016 by admin. 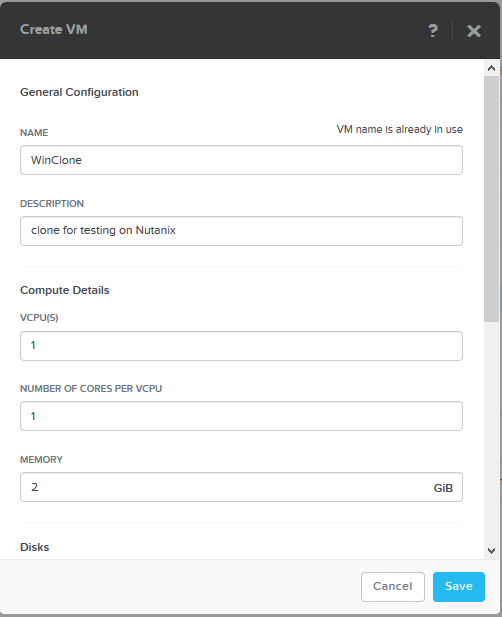 There are several great posts which show how to setup Nutanix CE in a HomeLab. 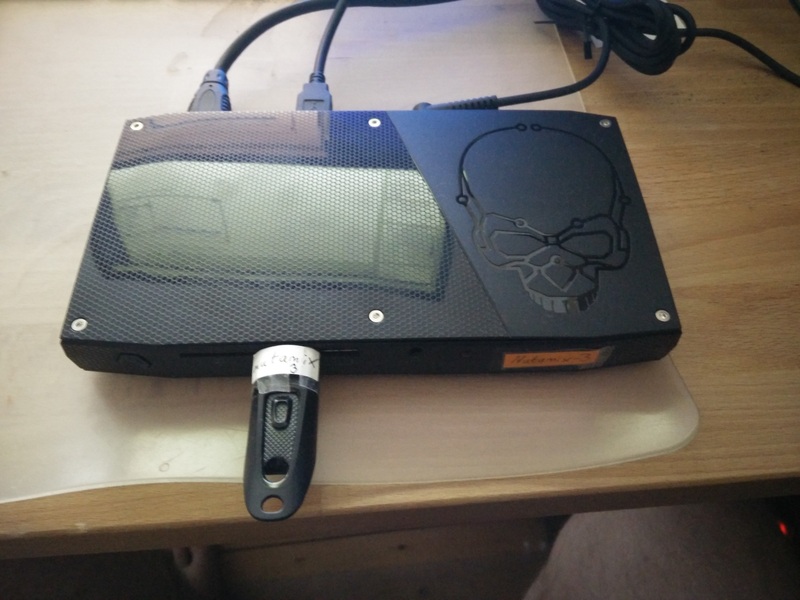 I will focus on my own setup , based on the Intel NUC6i7KYK. The setup is pretty straight forward up to the point when the onboard network comes into play. 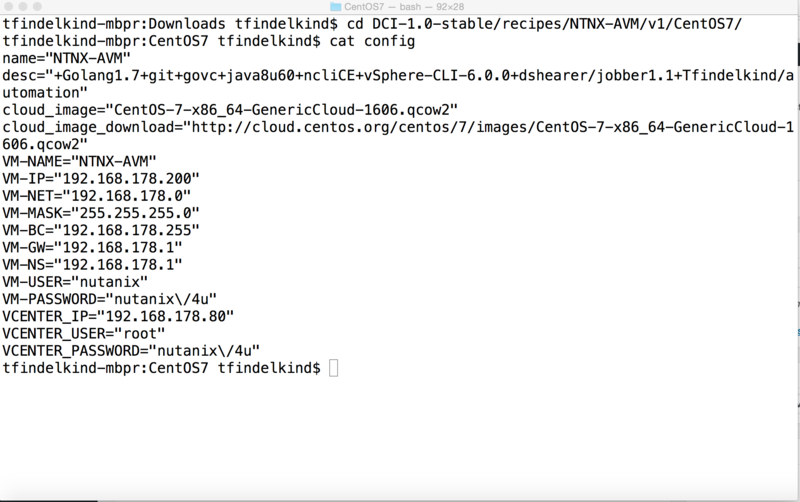 The Intel driver which is included in the Nutanix CE does not provide the right ones needed for the Intel NUC6i7KYK onboard network. Make sure your environment meets the minimum requirements. 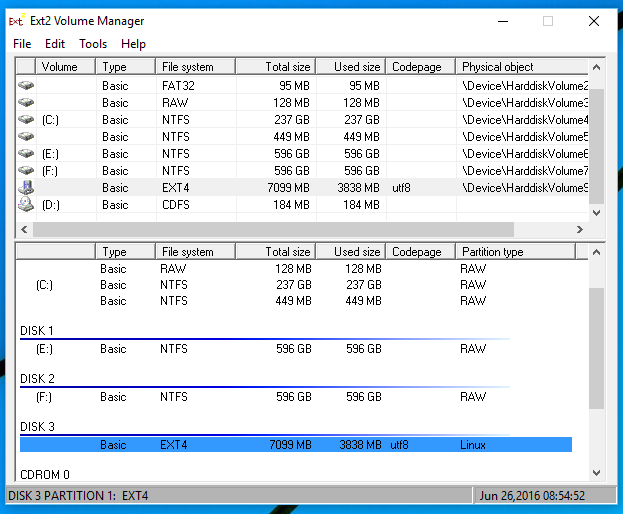 The table shows that a minimum of two disks are needed, at least one SSD. 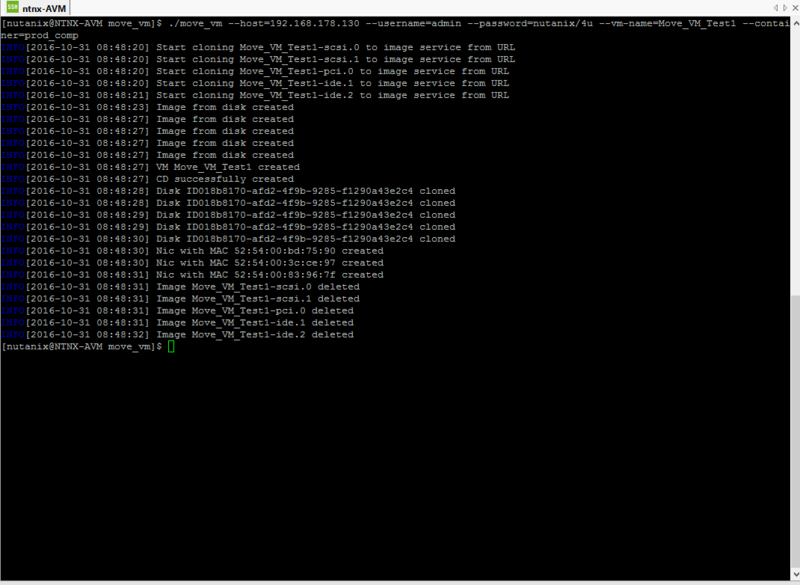 That´s the reason why I used 2x SanDisk X400 M.2 2280 in my environment. Remember that NVMe drives are not working atm. 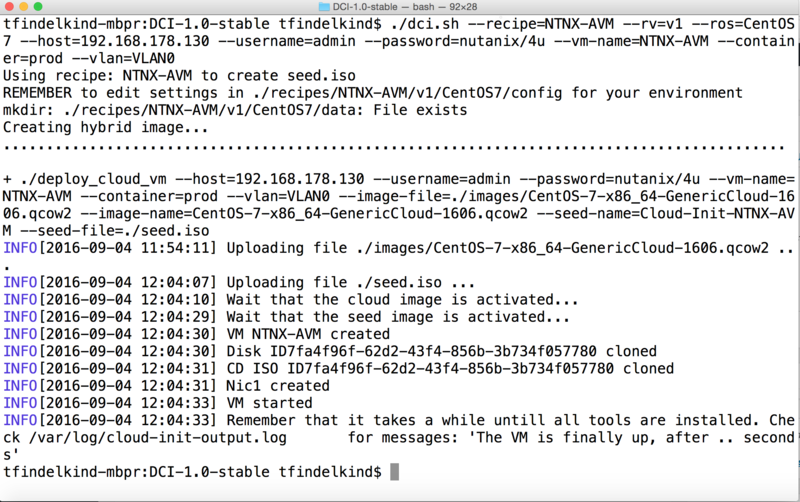 Download the Nutanix CE disk image which will be copied to an USB flash drive. 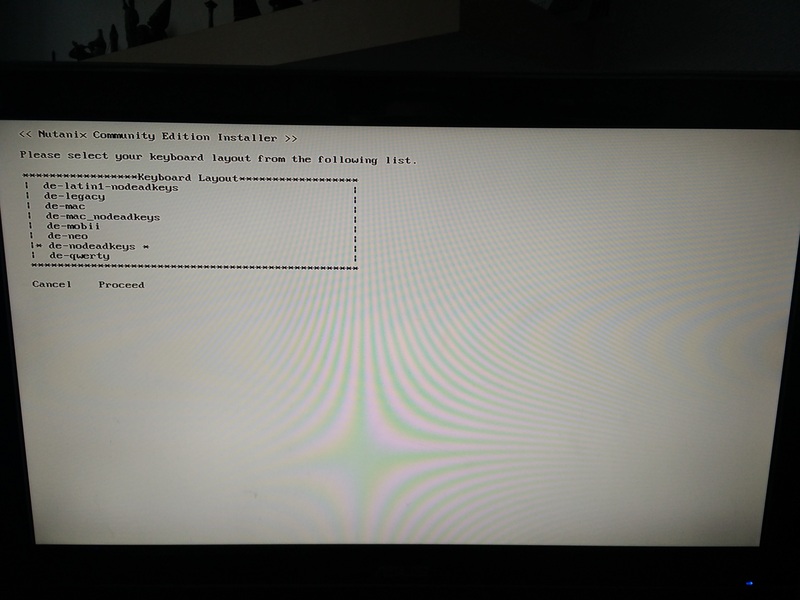 This will be the install and the boot device for this environment. The USB drive should be at least 8 GB in size but I recommend to use a device as big as possible. 32 GB flash drives starting at 10€. The reason is simple. If your environment for any reason starts to write extensive logs or data to the flash drive an 8 GB drive may end up with a wear out. Second! Maybe the image becomes bigger in the future? 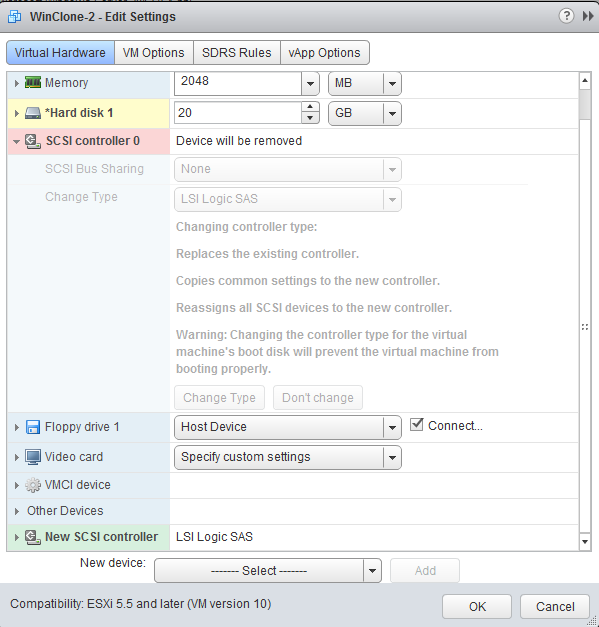 Boot from USB flash drive and start the installer with the right values (IP,DNS..) This step will install the Controller VM (CVM) to one of the SSD drives where all the Nutanix “Magic” resides. 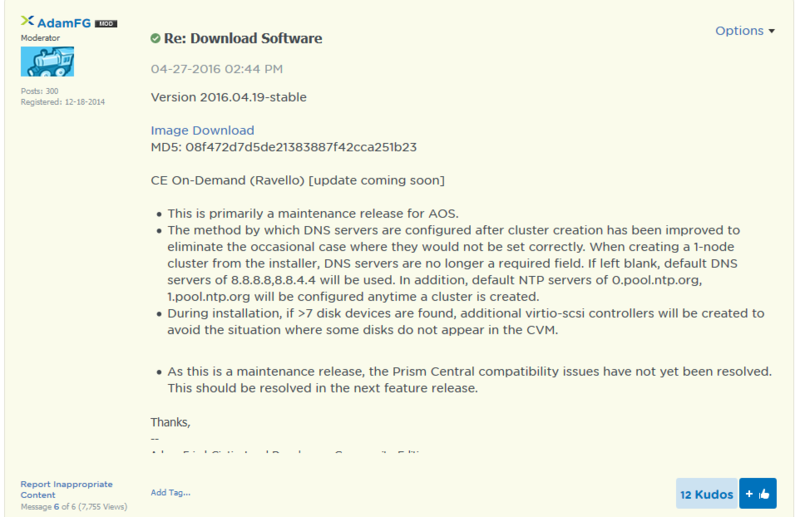 All local disks will be directly mapped to the CVM. 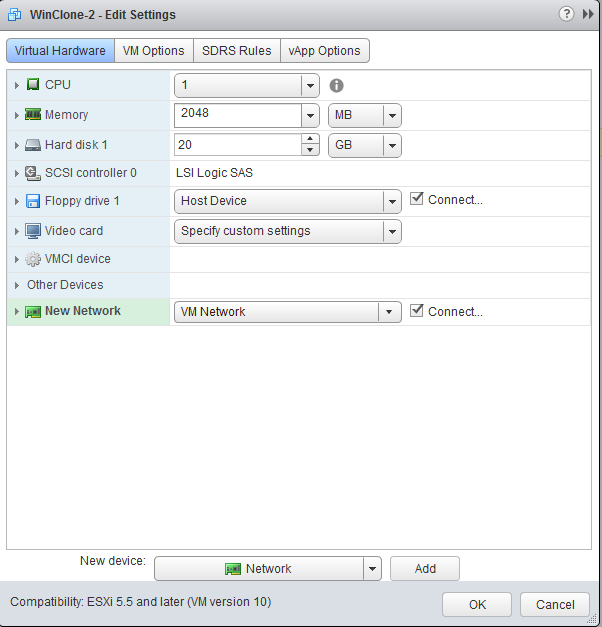 This means the Acropolis Hypervisor (AHV) which is KVM based is not able to use the storage directly anymore. If chosen a single node cluster will be created. 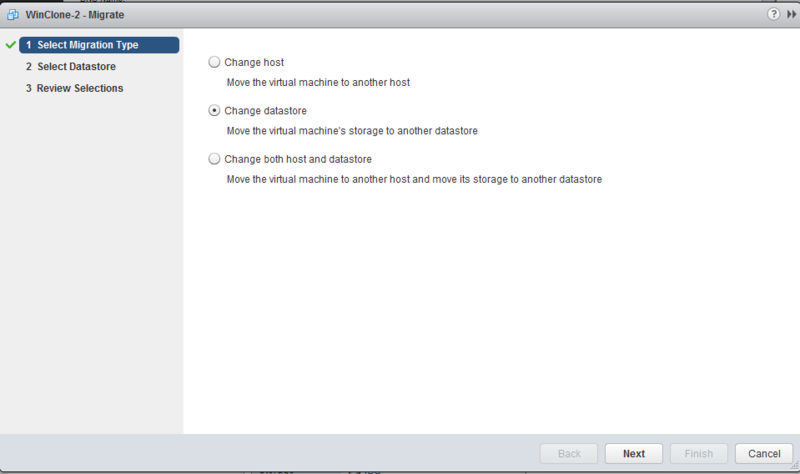 In my case where I will build a three node cluster I will leave this option blank. 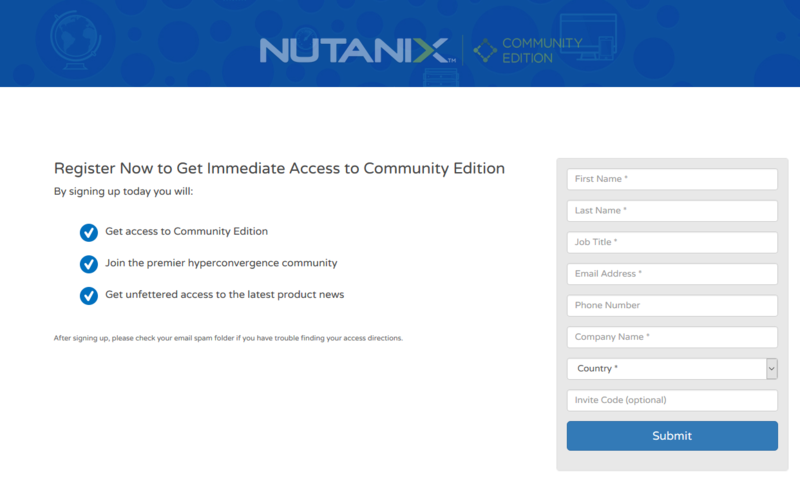 Download the Nutanix Community Edition. You need to register first! 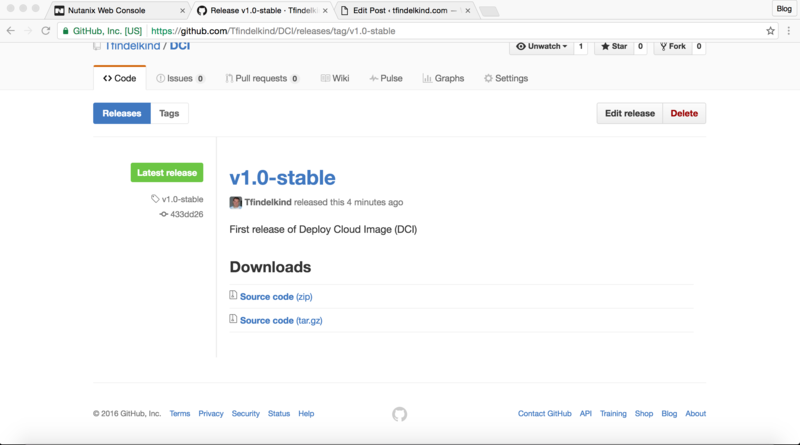 Download the software by scrolling down to the latest build. The image itself is packed with “.gz”. 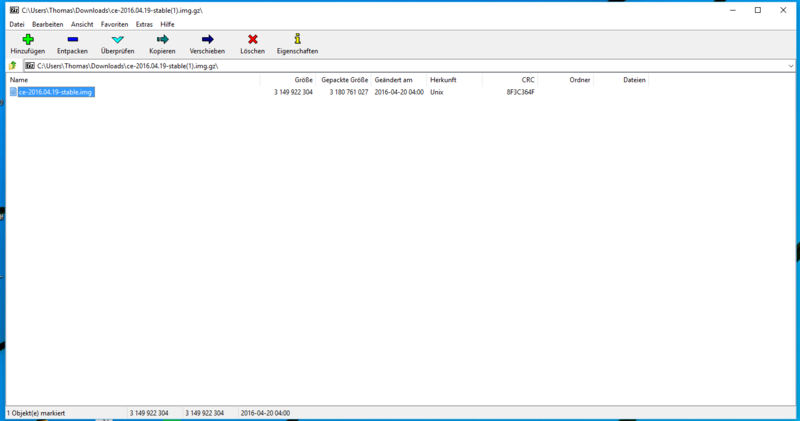 I used the tool 7zip to unpack the file. 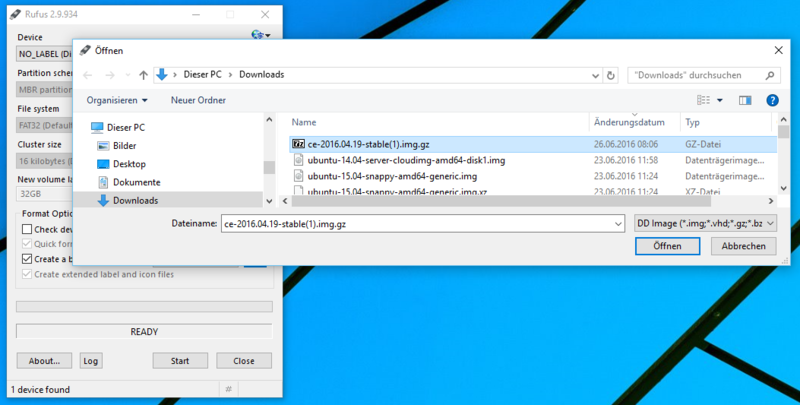 A file like ce-2016.04.19-stable.img will be unpacked which is ready to be copied to the USB flash drive. Now attach the USB flash drive and download the tool called Rufus. This program enables to “raw” copy an img like this one byte by byte to an USB flash drive. 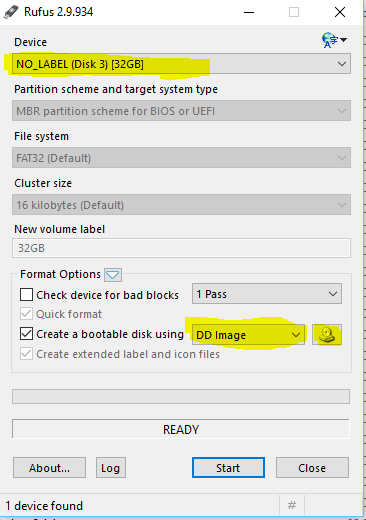 Choose the right USB flash drive, then switch to “DD Image” (dd means disk dump). 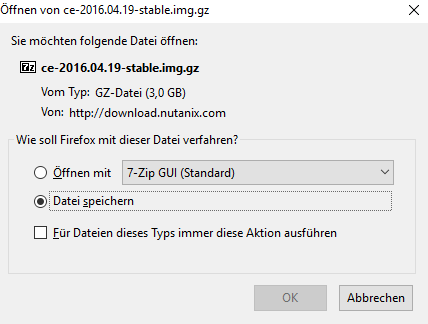 Last step is to choose the img file and “Start”. ATTENTION !!!! Make sure to choose the right device!!! The copy process takes a while! 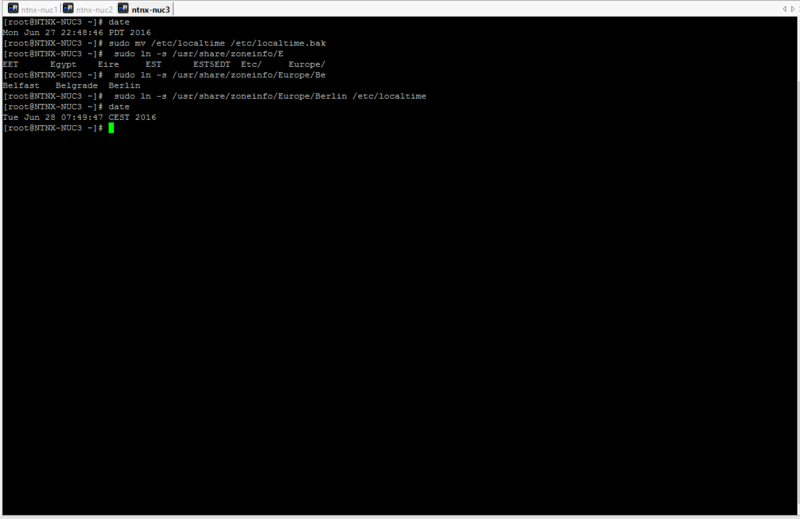 Now we need to copy the file “e1000e.ko” which is a kernel module to the USB flash drive. But the filesystem which is used on the USB flash drive is ext4 which MS Windows is not able to edit by default. So we need a tool like EXT2FSD to do so. 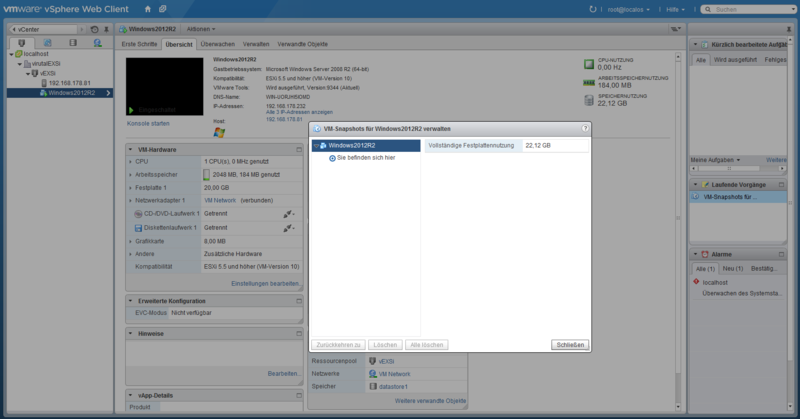 After the installation of EXT2FSD and a reboot you start the Ext2 volume Manager. In my case I needed to choose a drive letter manually to be able to work with the USB drive. 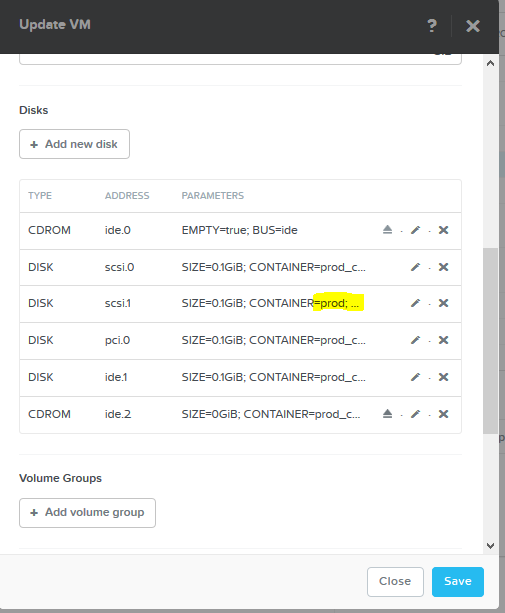 So scroll down to the right device in the bottom window and select the drive and hit the “F4” key which should assign an unused drive letter. 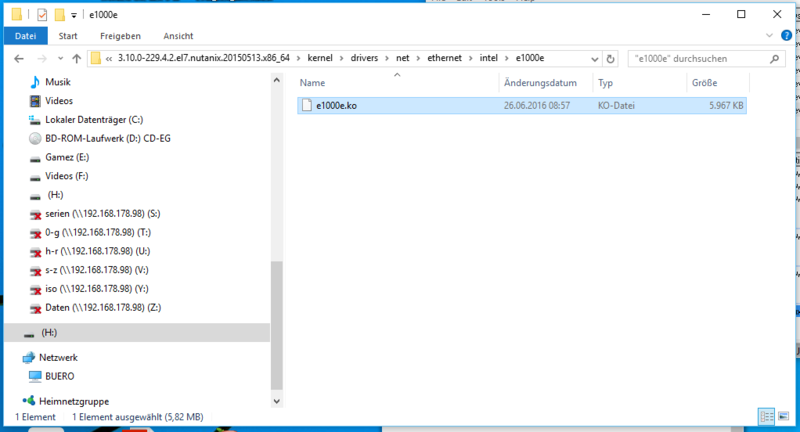 Copy the file “e1000e.ko” to the USB flash drive in the following directory: “/lib/modules/3.10.0-229.4.2.e17.nutanix.20150513.x86_64/kernel/drivers/net/ethernet/intel/e1000e/” and override the existing file. 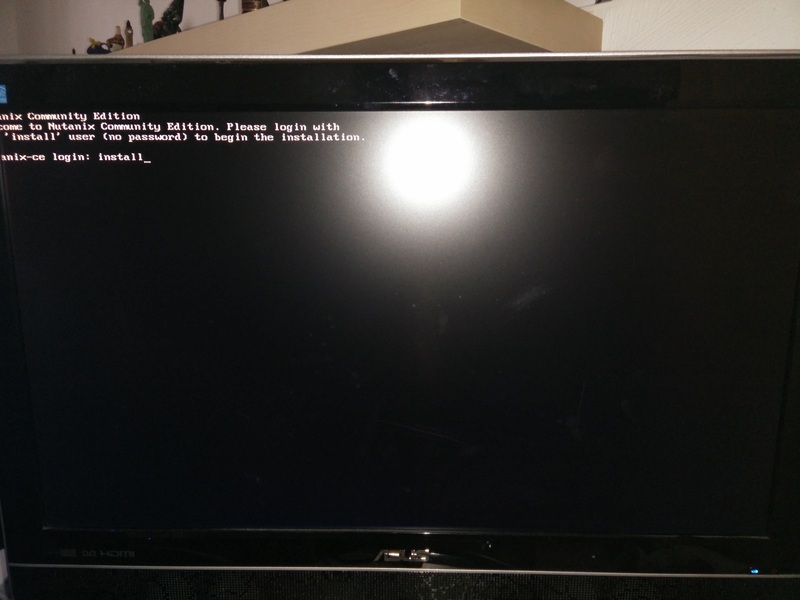 The USB flash drive is ready to boot on the Intel NUC6i7KYK! 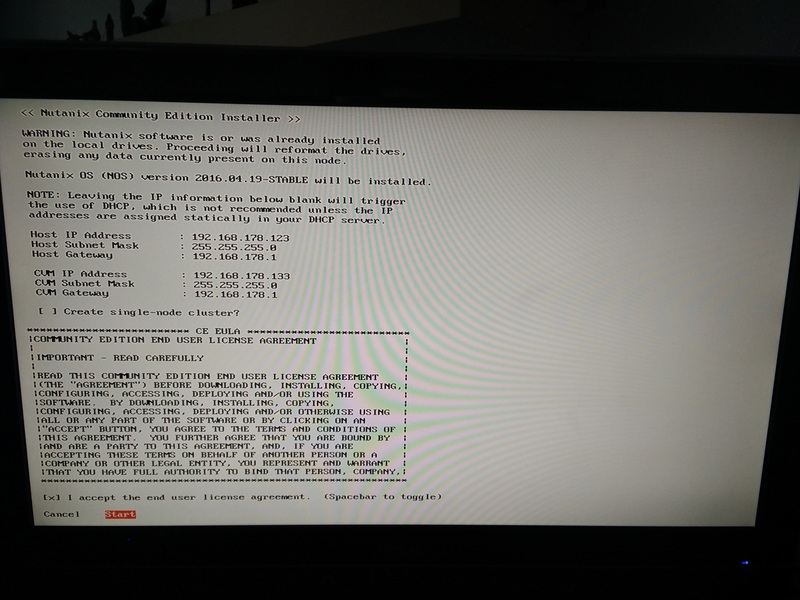 Attach the USB flash drive to your Intel NUC6i7KYK and boot it. 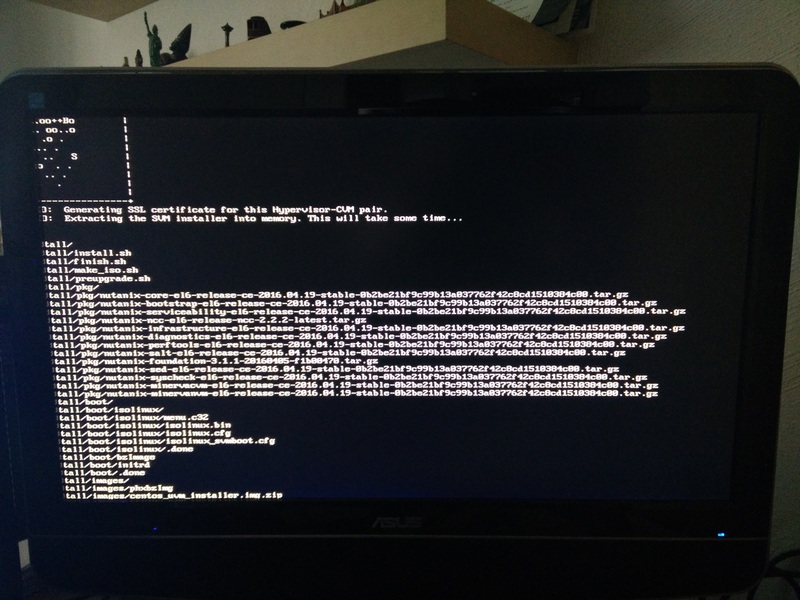 Feel free to change the boot order right now so that the Intel NUC6i7KYK will always boot from the USB flash drive. Now the Intel NUC6i7KYK is ready to boot from the USB flash drive. After the boot you should see the login screen. 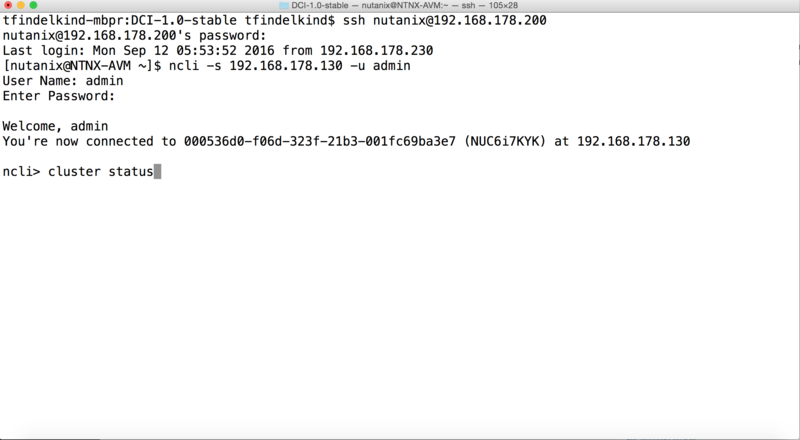 Login as user “root” with the password “nutanix/4u”. 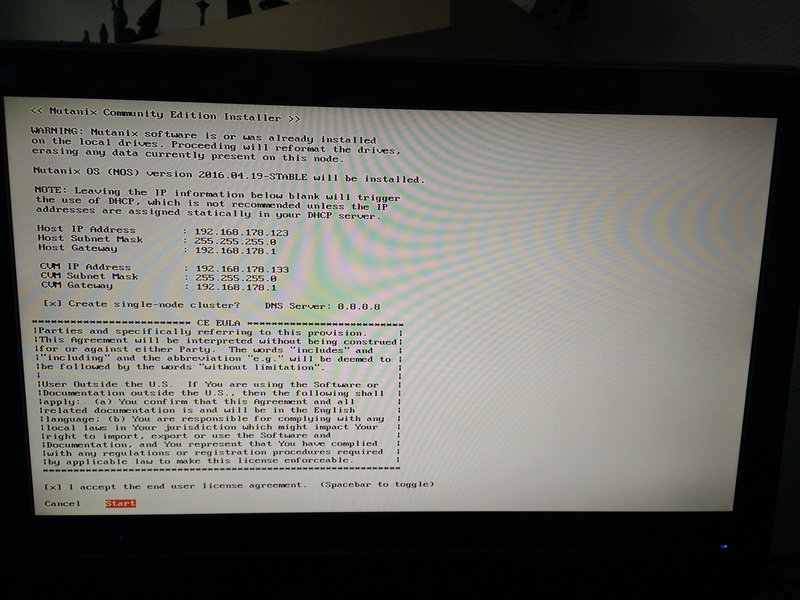 Loading the Intel network driver works with the command “modprobe e1000e”. Use “exit” to return to the login screen. The user “install” starts the installation. Choose your keyboard setting. In my case I used “de-nodeadkeys”. 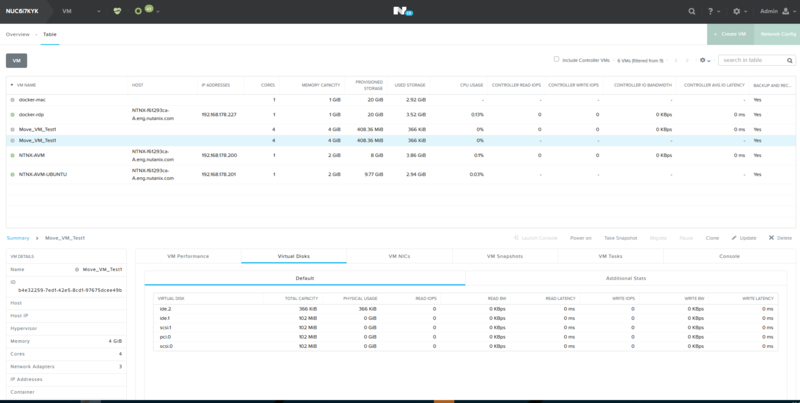 The following screen shows a small form. This is an examples for a single node setup. 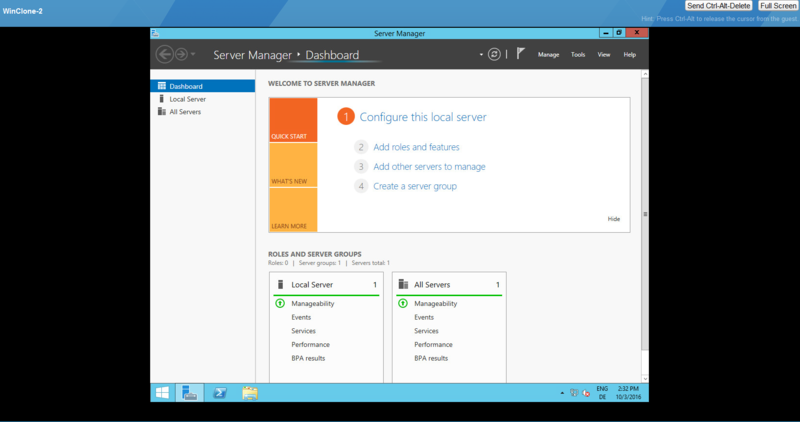 There are two IPs which are needed to be configured. 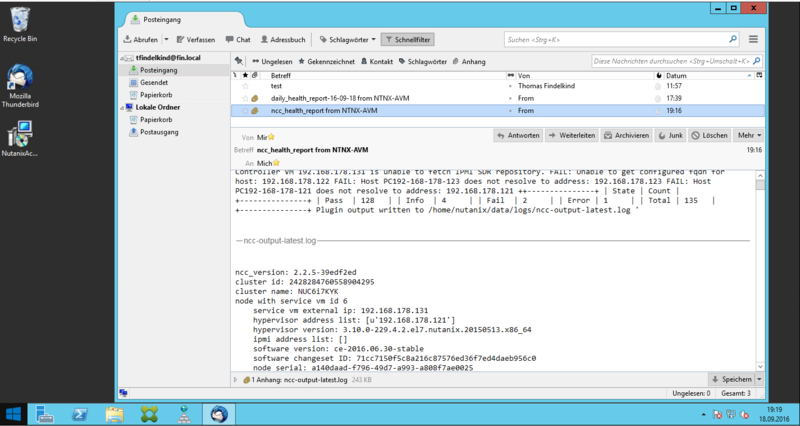 Host IP is the IP of the hypervisor. 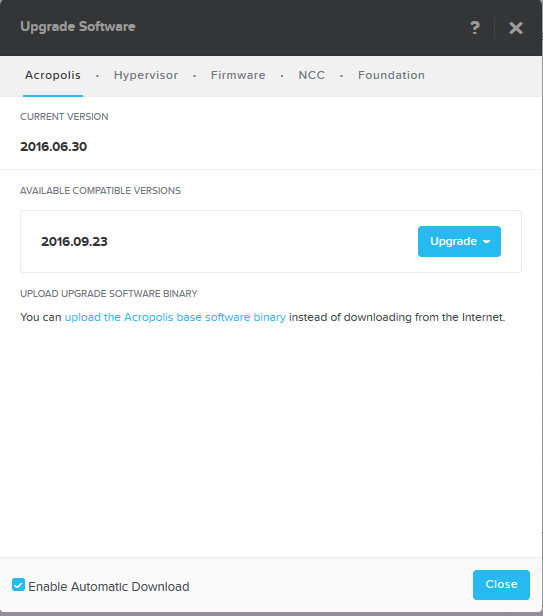 In the case of Nutanix CE the Acropolis hypervisor will be installed, which is based on the KVM hypervisor. 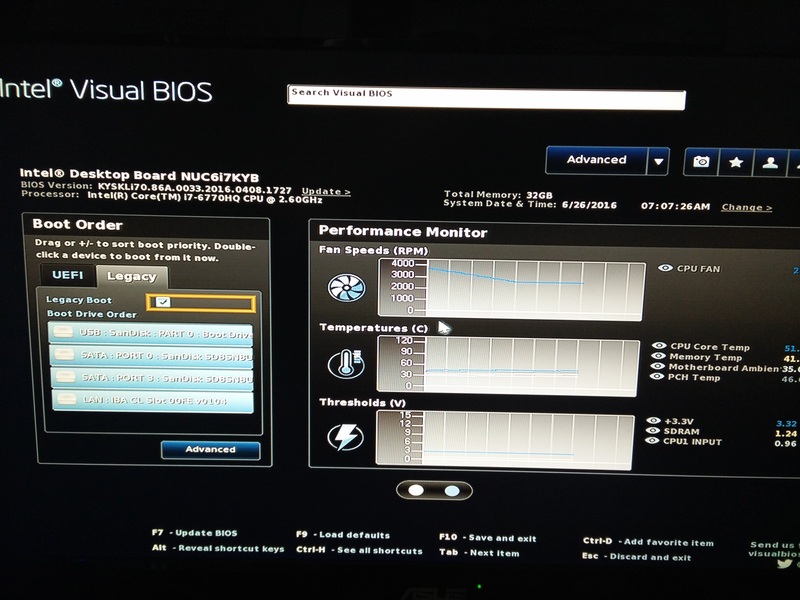 There are a lot of changes compared to the vanilla KVM so it is not the same. 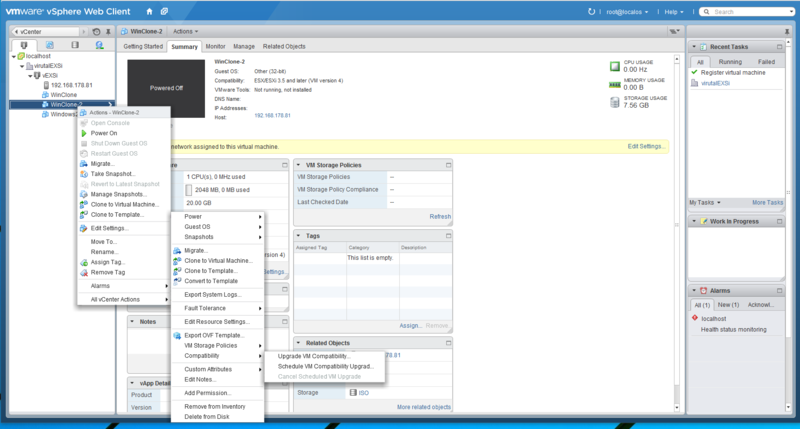 The logic of all Nutanix functions are implemented in the Controller VM. 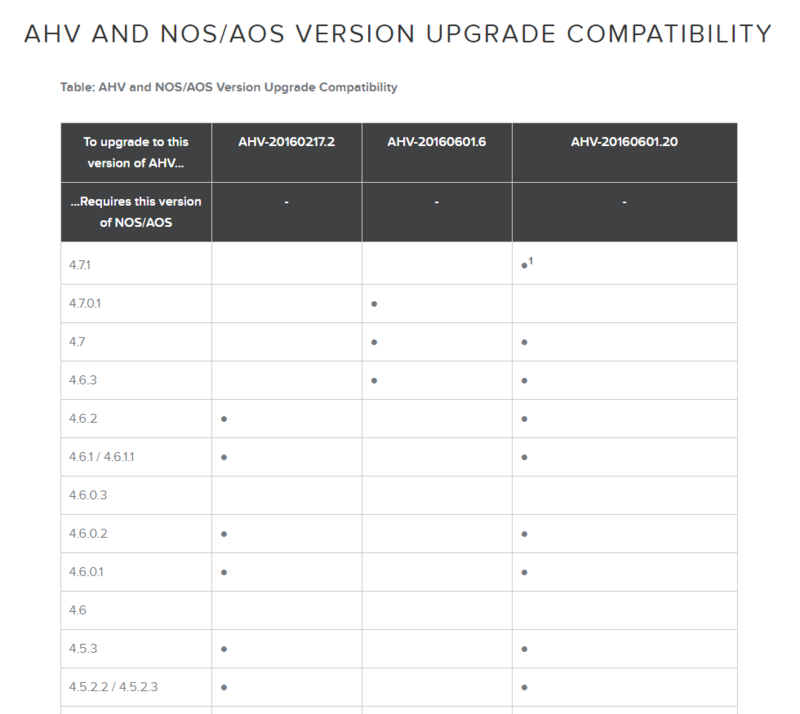 This is the reason why the OS which is installed in the VM is called NOS (Nutanix OS). 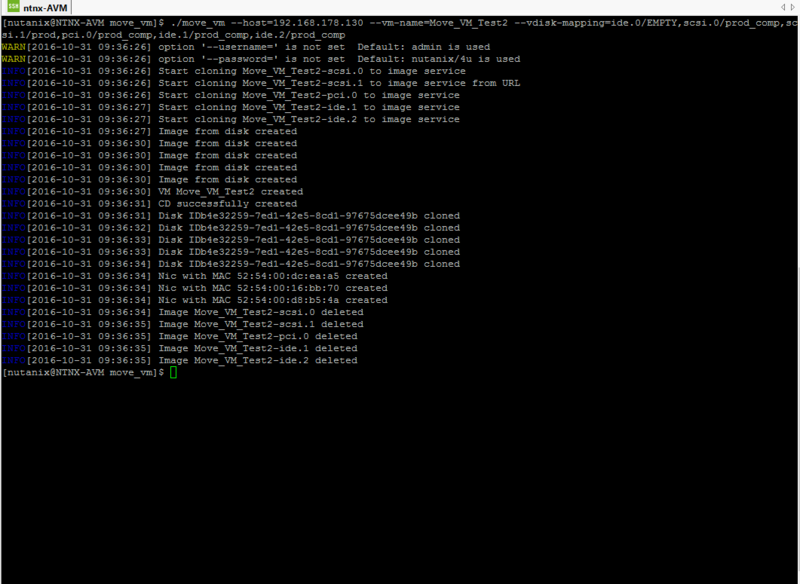 NOS is based on Centos. The installation takes a while. 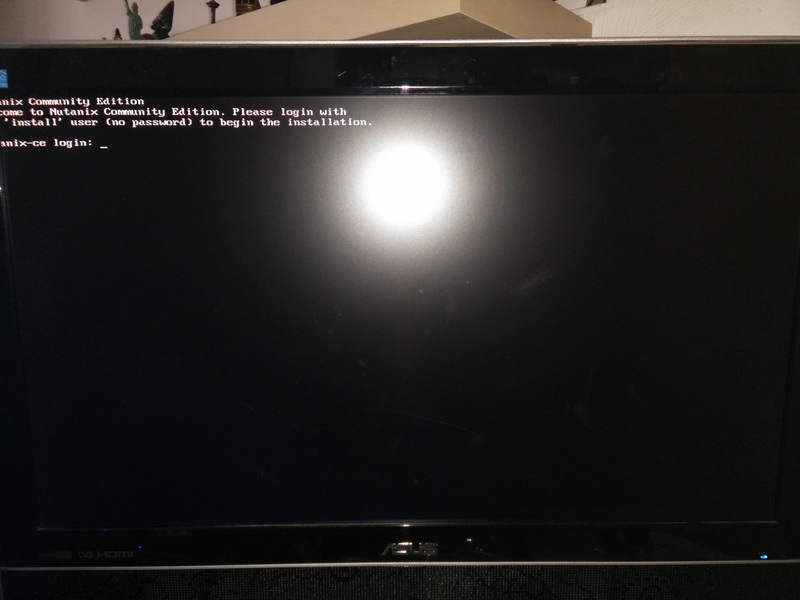 In the end you should see a login screen with a random hostname. 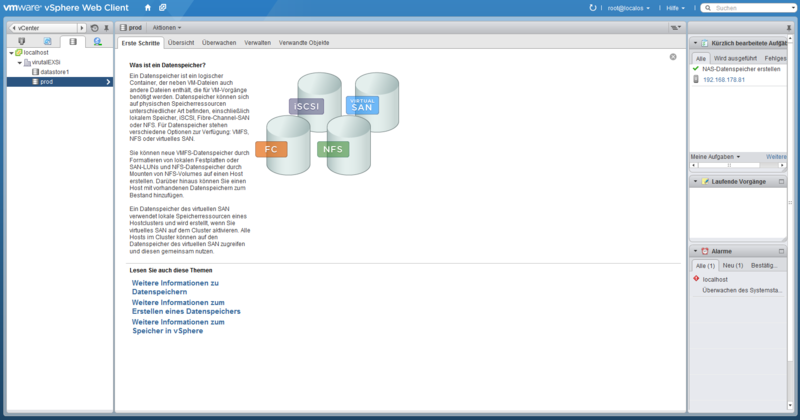 The next post will show the configuration of the cluster. 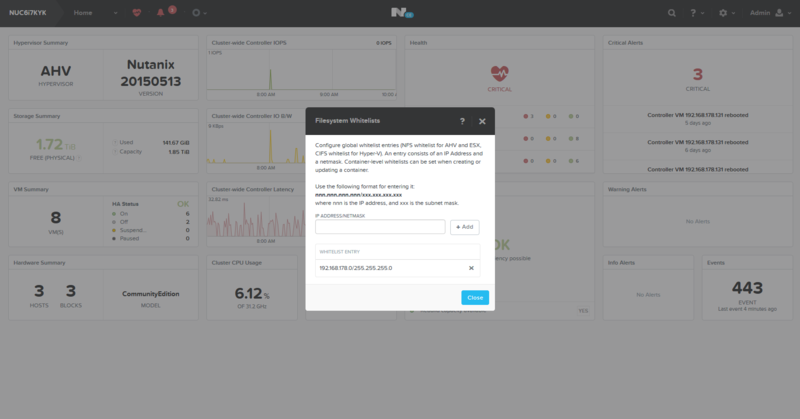 This entry was posted in Nutanix on June 27, 2016 by admin.